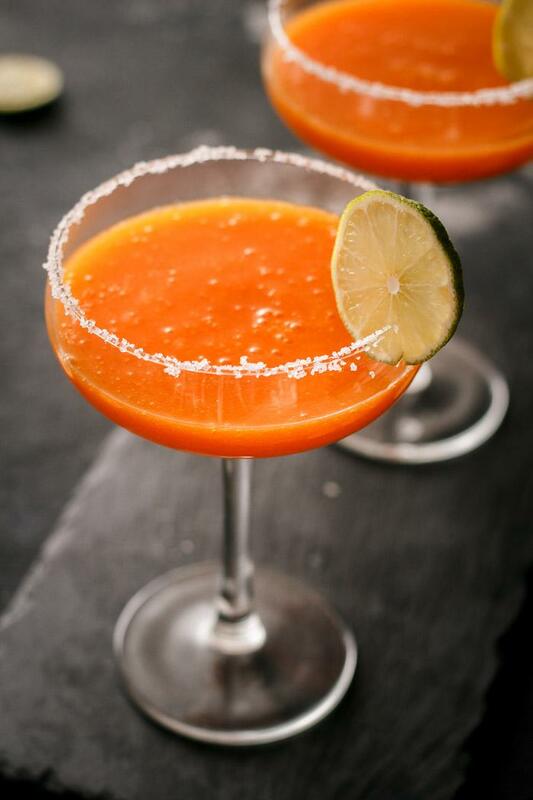 Who doesn’t love a simple refreshing margarita smoothie with mangos? I sure do! Hey, it’s been a LOOOOOONG time. Way to long. I’ve missed posting here so much. I’ve kicked myself in the rear end this week and made a plan for a few future recipes. Hopefully, I can see them through! Baby Jernej is not so little anymore. He’s standing on his own now, crawling all around the place, exploring the world and filling our hearts with all kinds of joy. If you wanna see what’s going on in our personal life head on to my personal Instagram account. And now to the recipe. Today is National Margarita Day and I made a non-alcoholic mango margarita smoothie. I’d say cheers, but it’s long gone. There’s something about mangos in smoothies. Puréed mangos give such a nice smooth texture to drinks. They are one of my favorite fruits to put in smoothies, besides avocados. All due to the texture. Okay, and flavor too 😀 What are yours? Peel mango and juice oranges and limes and blend all until smooth. 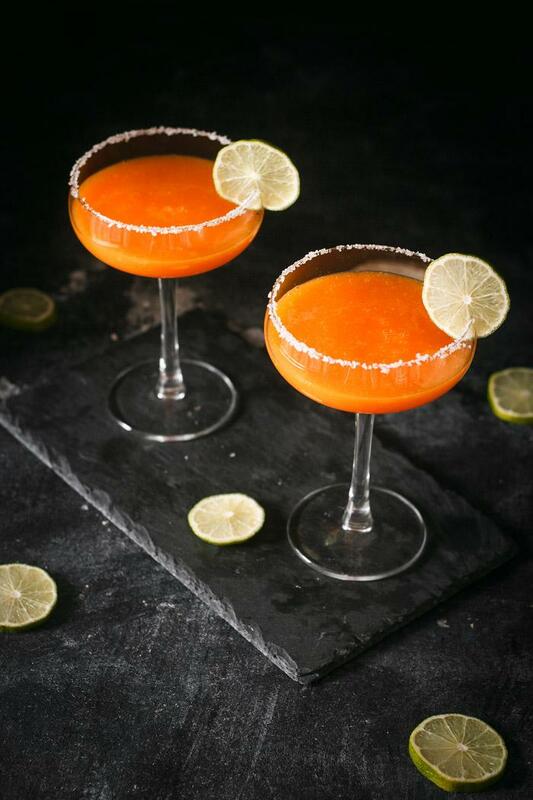 Run a lime wedge around the outside of a glass and dip the rim in some salt for garnish and taste. 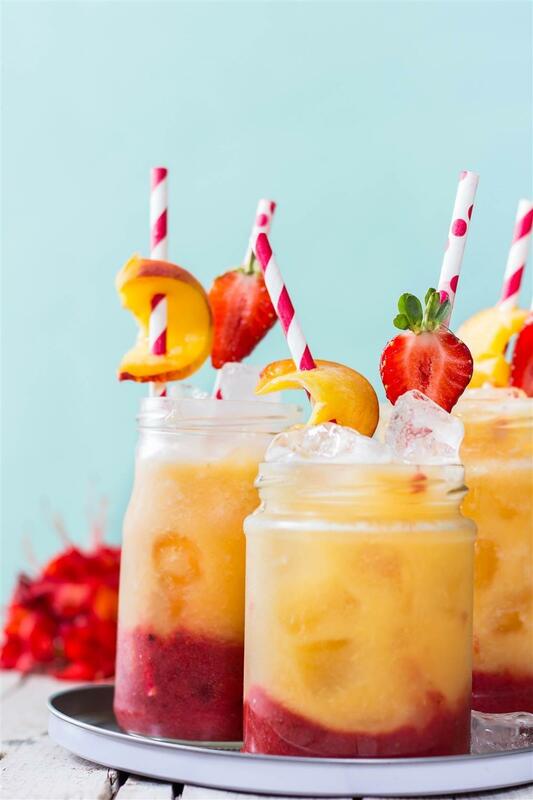 Pour in the smoothie. 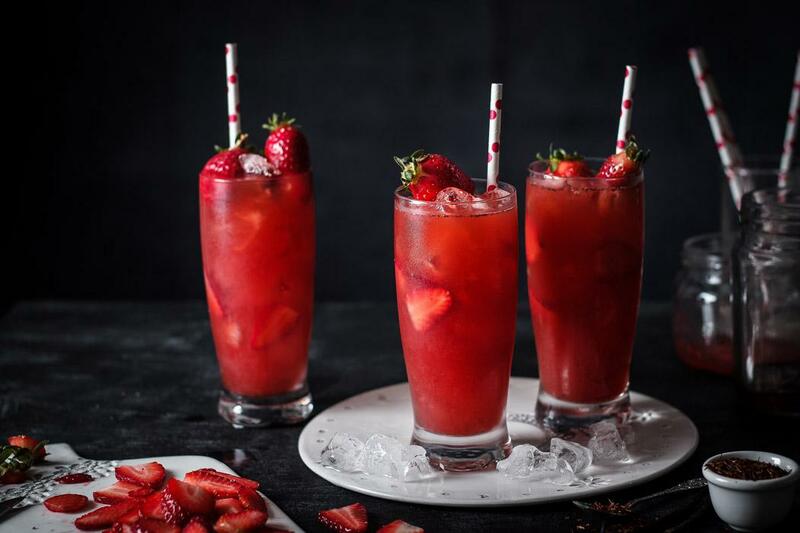 A refreshing spring vanilla strawberry iced tea – perfect combination of rooiboss tea, vanilla and strawberries. Keeps you cool and hydrated during sunny spring days! 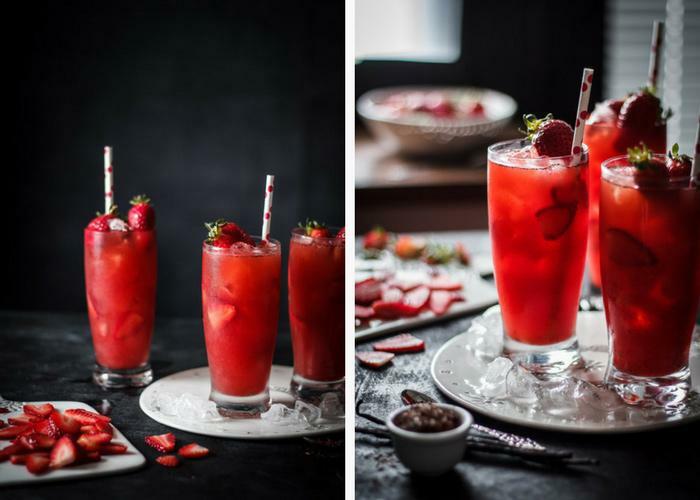 I’ve made this delicious drink last week while baking the strawberry cake for my birthday. My birthday is on March 22nd and it just happens that that’s also World Water Day. I love that! I love water! Water is also my absolute favorite drink in the entire world, besides tea. I don’t actually know anyone who would drink as much tea as I do. I’m gonna be honest with you – tea can get boring at times. Adding fruits and some ice will do the trick though. 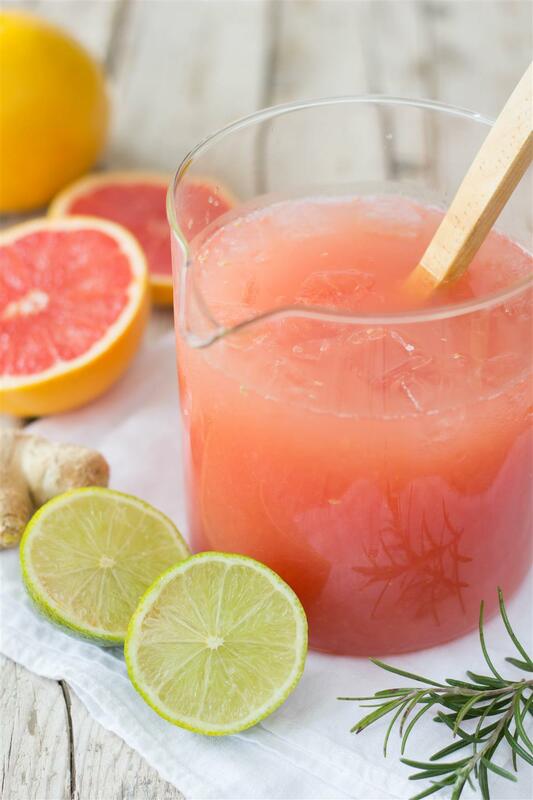 Makes it refreshing and adds a bunch of vitamins to your drink. 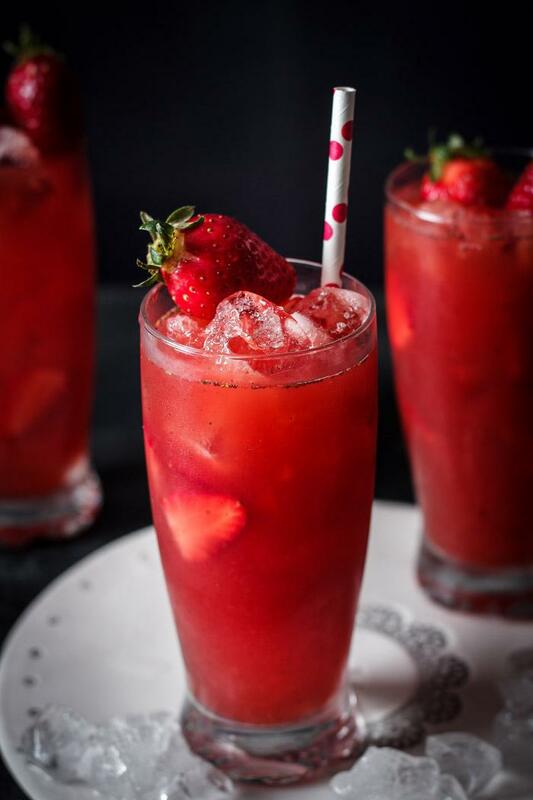 Since I was already making the strawberry cake last week I figured why not make a strawberry iced tea. I had a ton of strawberries anyway. Lately, I’ve been obsessing over rooibos tea, which I find so nice and sweet with a slight vanilla flavor. Besides my daily three cups of raspberry leaf tea this is the one tea I drink the most. Since it’s getting quite warm over here, I’m drinking it cold. 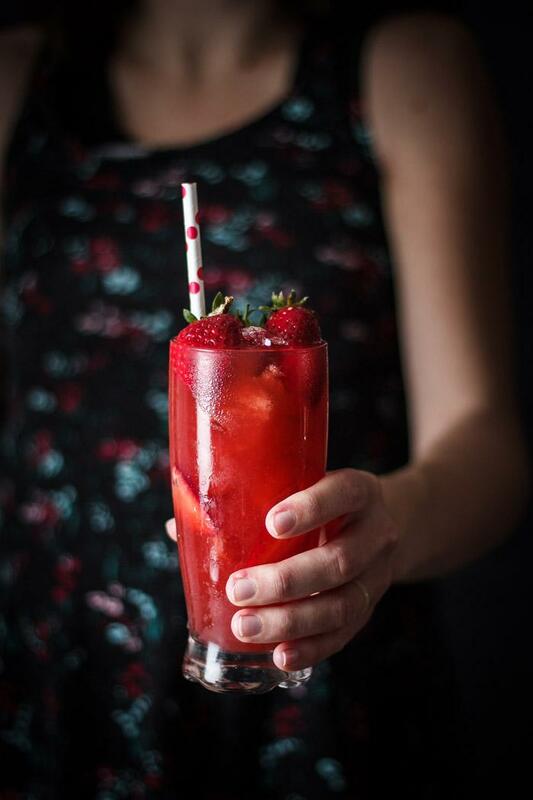 And GUESS WHAT it’s a perfect match for strawberries. It really is! And since I’m loving the mild vanilla flavor in the rooibos, I added more vanilla, ‘cuz WHY NOT? Let me know if you try it and think the same! Regarding the prego belly. It’s still here and the baby is still very and I mean VERY lively. Doesn’t seem to want to come out any time soon, but we never know. I’m hoping for April 1st! I’ve also managed to do some gardening. I’ve tranfered my little tomato seedlings to bigger pots, so they’ll have enough room to grow. The truth is, we have to buy tomatoes by the middle of July, sometimes even more. It’s seems so unfair. I’m looking at the growing plants for months before the tomatoes go red. It always seems like the wait is way too long, although totally worth it. Okay, I’m babbling. I’ll stop now. In a big saucepan boil water and add red rooibos tea and steep covered for 10 minutes. After the tea has finnished steeping strain it into a big jug. Uncover and leave to cool. 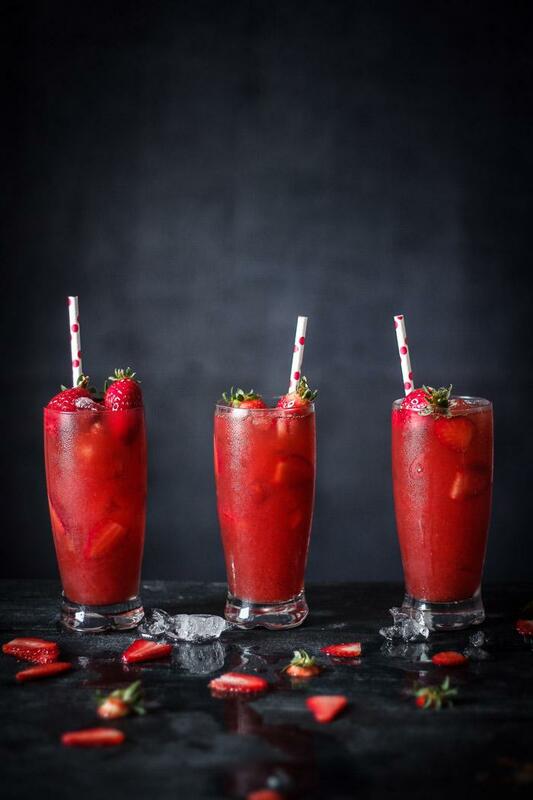 Meanwhile, remove strawberry stems and discard. 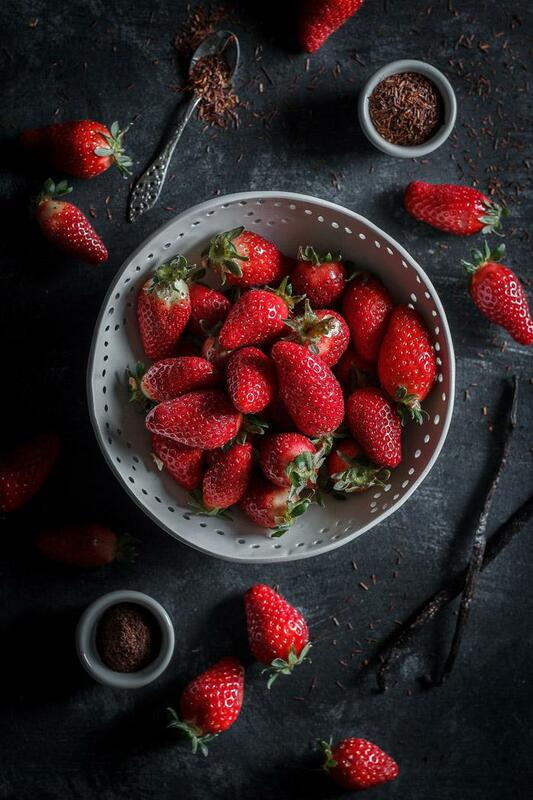 Place the strawberries in a blender and make a smooth purée. If you prefer your purée to be without the tiny pits, strain it through a fine strainer. When the tea has cooled down to almost room temperature add honey and mix well. 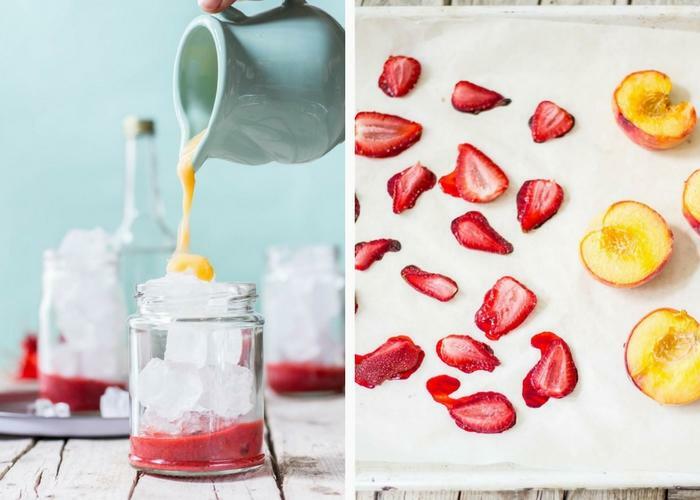 Add strawberry purée and vanilla, mix well and pour into glasses filled with ice. 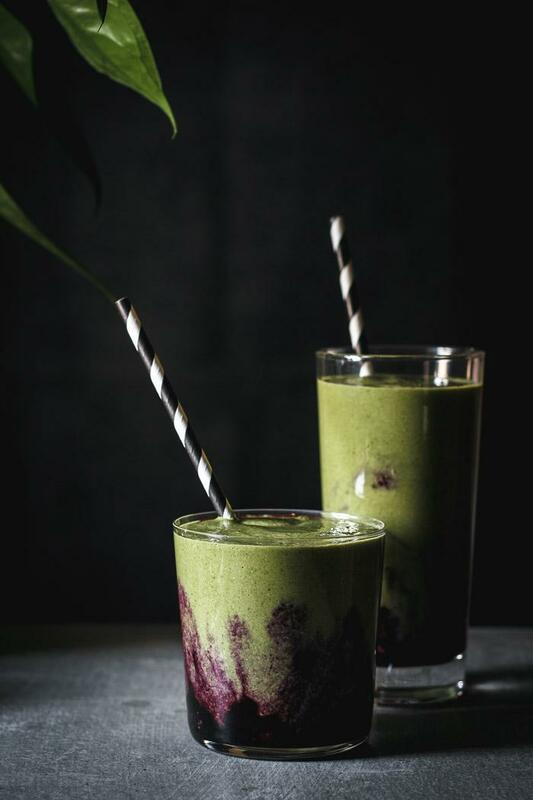 This blueberry matcha smoothie is full of antioxidants and a perfect energy boost for the morning. 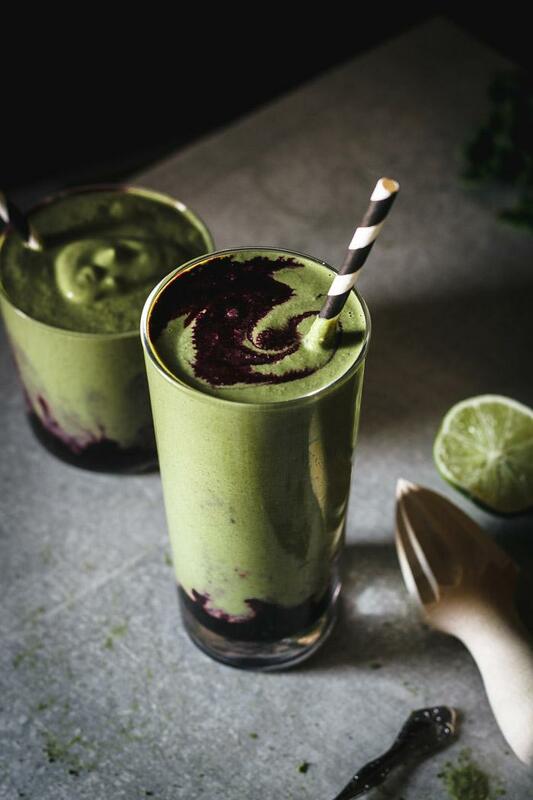 It’s a delicious healthy vegan, dairy free and gluten free green smoothie with blueberry mash. So good! I’m getting so excited about spring and can’t wait for everything to go green. We’re already able to waste our time outside in nothing else but a sweater. Remember my love of balcony life. Well, here it is! I can almost smell spring 😀 Winter this year sucked, almost no snow… I mean it was cold, which is okay by me, but no snow. Come on, that’s just unfair! 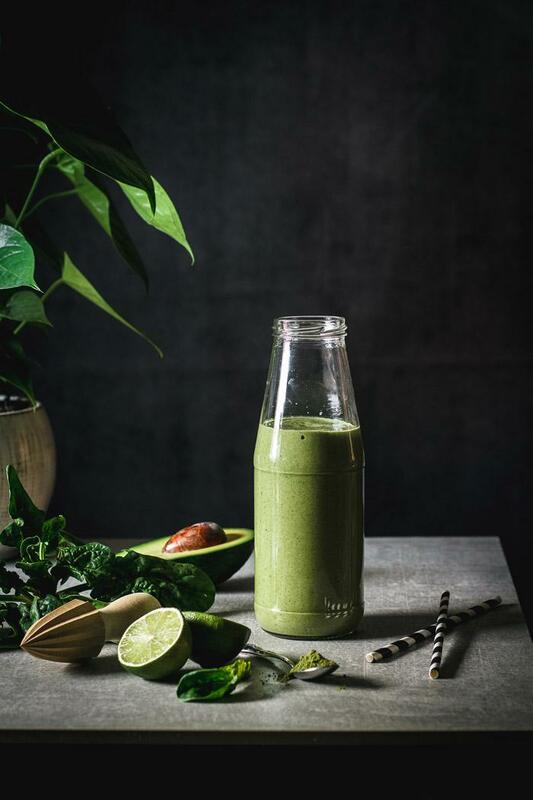 With the spring knocking on the door, the season of some new green leaf veggies is starting and I’m able to add them to my green smoothies. 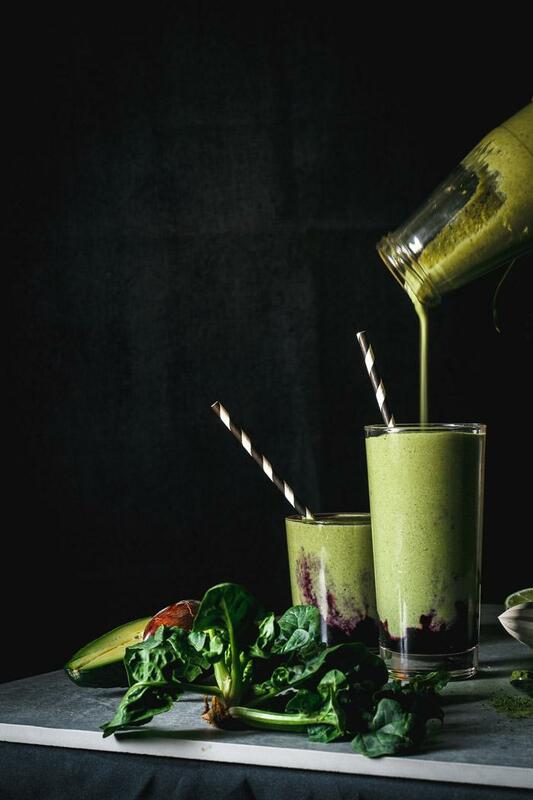 I got hold of some really nice fresh spinach last week and I couldn’t resist to make a delicious smoothie for breakfast. There are still some frozen wild blueberries in the freezer, which I love for breakfast. In the winter I heat them up and pour over the pancakes with some yogurt. Yum! Ok, ok, back to the smoothie. So I named this drink matcha smoothie, because I added a little for some nice morning tea feeling. 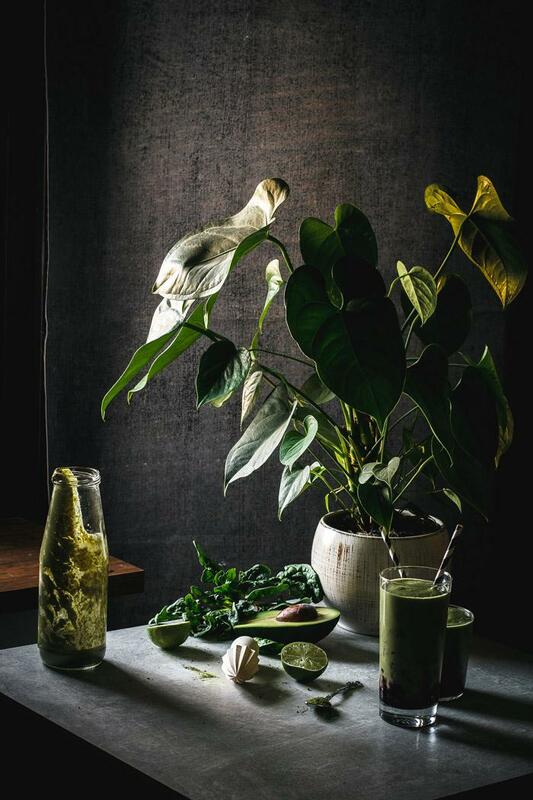 Mmm, cozy 🙂 I don’t know why exactly, but for me drinking matcha – in any form – is like a warm hug. Even if I drink it cold. And now here’s the recipe, finally. 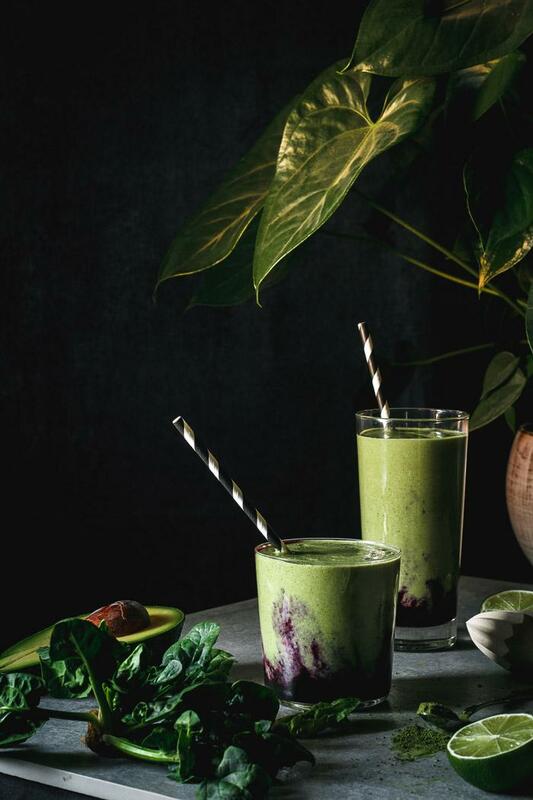 This matcha smoothie is packed with antioxidants and contains a bunch of cashews and an avocado so it will leave you fed for a while. Cheers! Mix everything except blueberries in a blender until smooth. If the smoothie is to thick add more water. Place blueberries in two glasses and mash them gently with a spoon or a mortar. 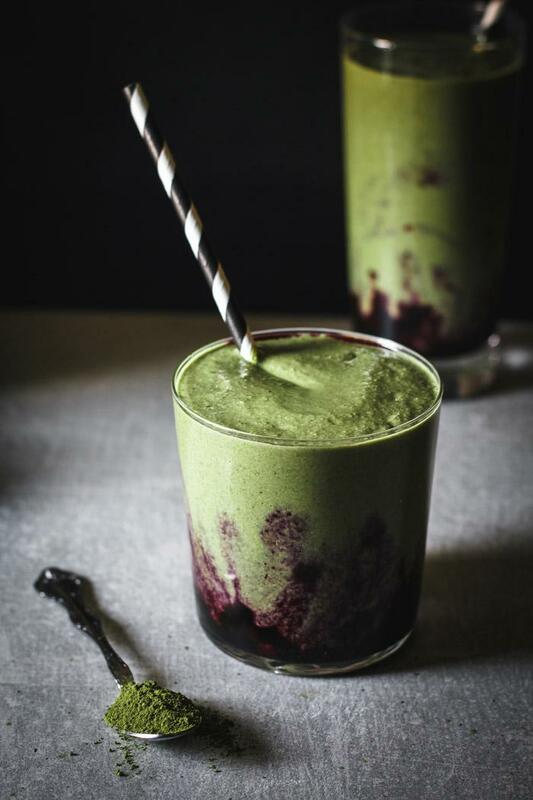 Pour the green smoothie over mashed blueberries and enjoy! 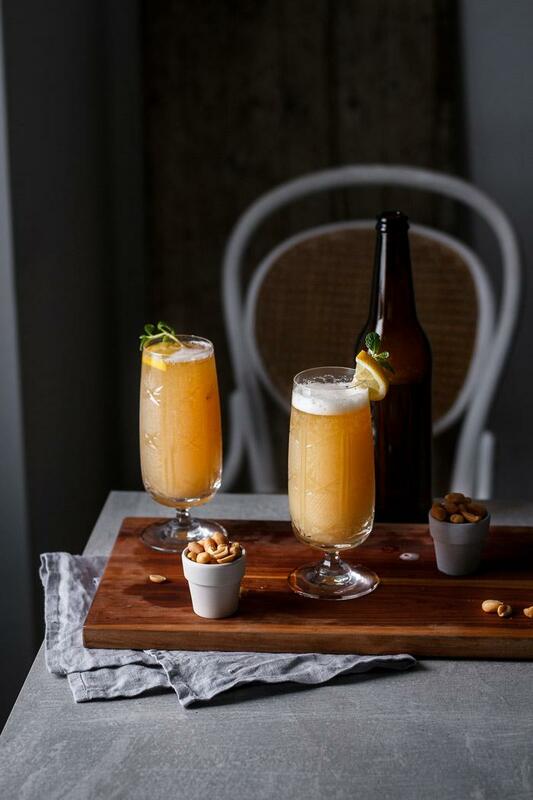 This sparkling pomelo ginger shandy is a nice refreshing drink with a little kick of spice, perfect for lazy sunny late winter days. What do you do when you can’t have booze? 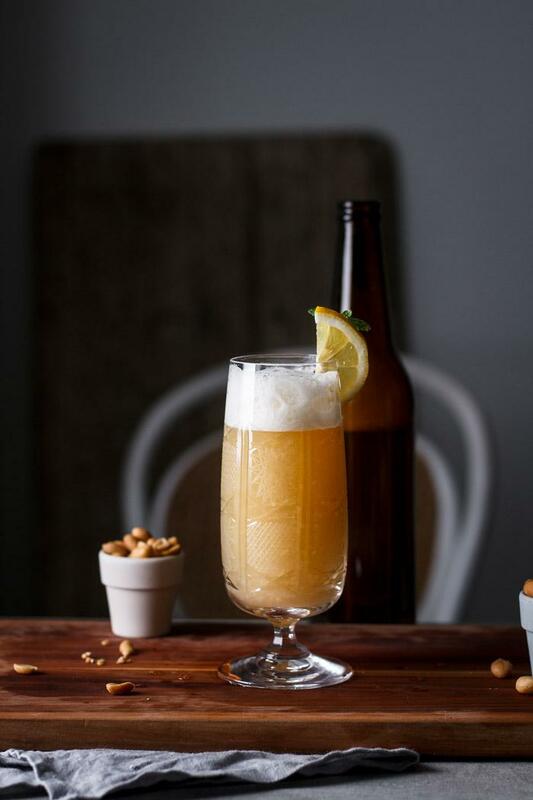 Make something out of beer. Yeah, yeah, I know many of you will say beer without alcohol is not beer at all and you might be right. Some of them taste…hmmm. How should I put it? Miserable. But when you’re pregnant and can’t have alcohol, trust me, it’s much easier to like non-alcoholic beer. Some brands make very good ones, but I’ve also had one that tasted like a chewing gum. Uhm, not so good! 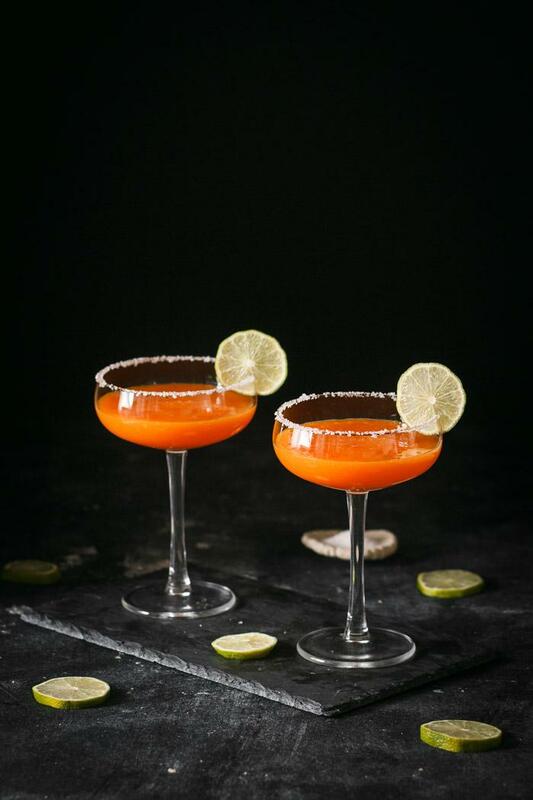 Well, it was about time to make another drink recipe, since it’s been a while now. 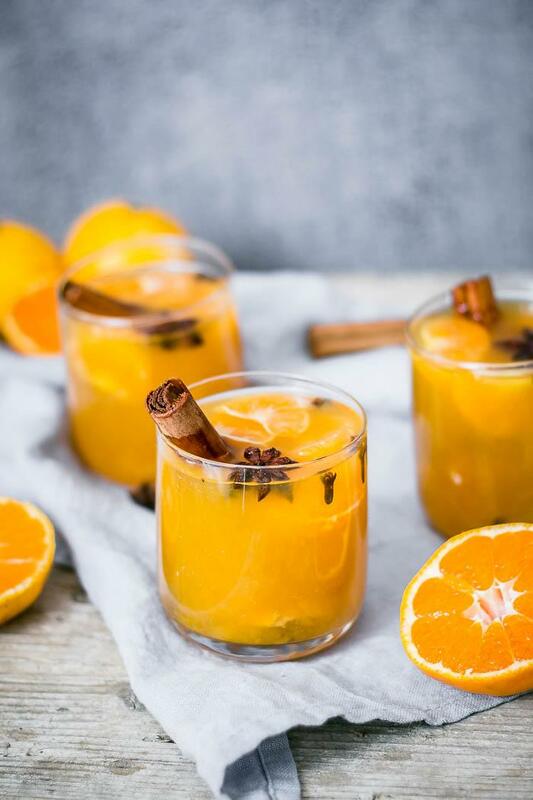 I’m all about citruses during this winter. I don’t think I’ve eaten so many oranges and mandarins at any point in my life and a big squeeze of lemon in a glass of water is a total must. I haven’t had any pomelo, so I thought I’d put it in a sparkling beer drink with some spicy ginger and have a pomelo ginger shandy. Pomelo is such an awesome fruit, it’s sweet like a grapefruit, but doesn’ have the bitterness, which is great for a beer drink, since beer is already bitter. On top of all the pomelo juice, the ginger gives the drink a little heat and warms you up 🙂 That’s why I love ginger! 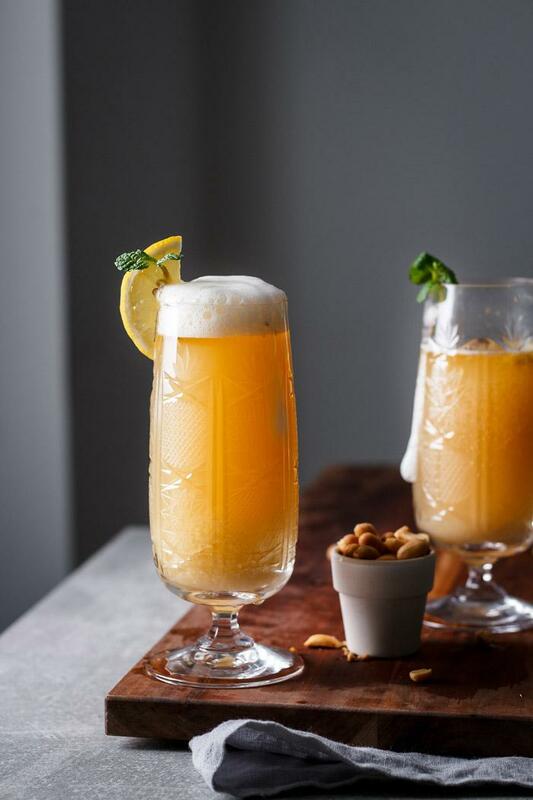 This pomelo ginger shandy is such a nice refreshing drink for the lazy days leading to spring, sitting in the sun on a balcony wrapped in a warm blanket. Listening to bird singing starting again, such a lovely time. I’m getting sentimental. Our balcony life (yeah, this should totally be a title of a movie) is gone during the winter, but when the sun starts to become warmer and the days get longer, we start hanging out on the balcony again. During the spring and summer it’s where we eat, play board games, read and do pretty much everything. Like, who needs the indoors, anyway?! Add all ingredients to a mortar and make a smooth paste. 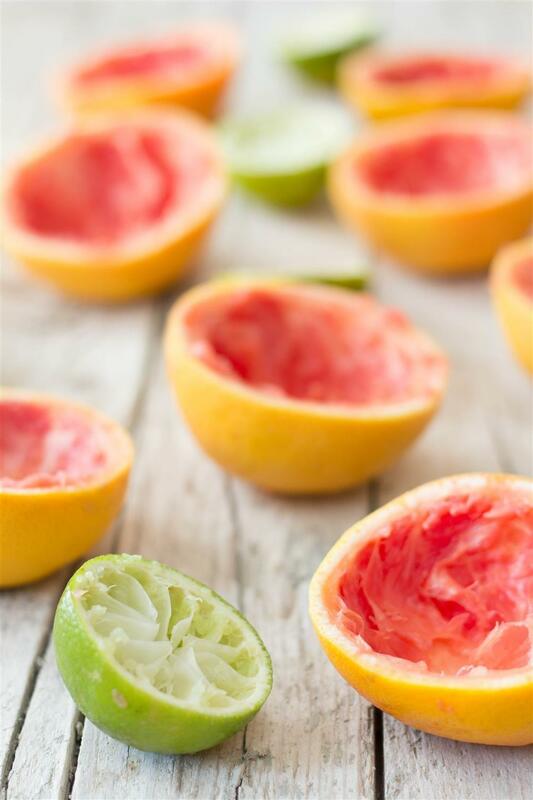 Pomelo is a big fruit and it's hard to juice it on a regular juicer. 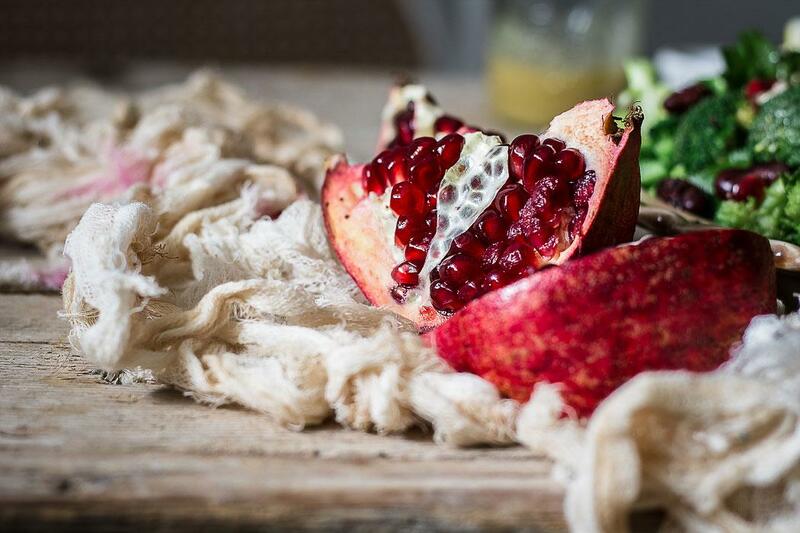 I peel the pomelo and remove the thin white skins, then blend it in a blender for a minute or two and use a nut milk bag or a tea towel to squeeze out the juice. 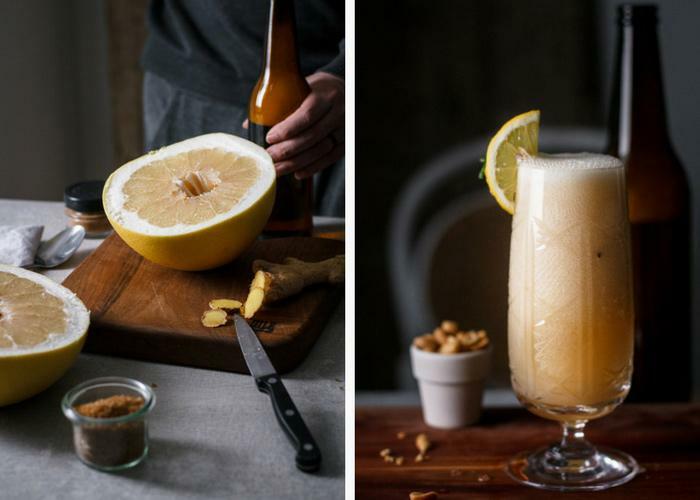 Mix together pomelo juice and simple ginger syrup, pour into glasses and add beer. 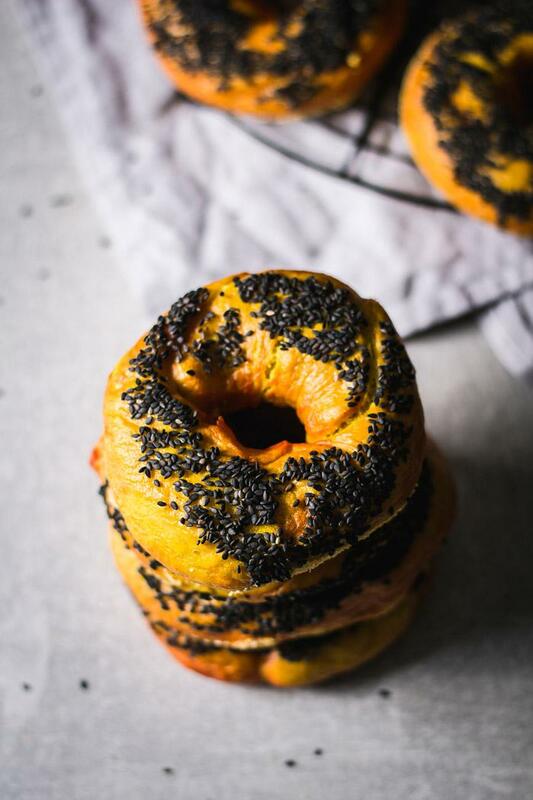 The softest low-fat black sesame covered chewy turmeric bagels that are ridiculously tasty and a great basis for a breakfast sandwich. Guess what, it’s the first time we’re making bread together. A shocker!! Ok, we’ve made some flatbread, but not bread like this. Bread making is definitely one of my biggest cooking/baking passion. Digging in the dough and getting your hands all sticky and messy is the best part of making bread at home. And if you think it’s hard, it’s actually not. Sometimes it requires a little time, but it’s mostly just waiting and admiring your beautiful work. How’s that for a change of perspective. I’ve just recently discovered the art of cooking the bread before it goes to the oven and that’s so lame, right? How could I be ignorant for so long! Cooking the dough before putting it in the oven makes for a nicely browned crust and a chewy middle. Like all bread, I like bagels best when they’re hot. I was always told that eating warm bread would hurt my stomach, but I’ve been doing that for all my life and my stomach is just fine. For now 😀 What can I do, it simply tastes better and its so soft. Who’s with me? We’re making bagels today. 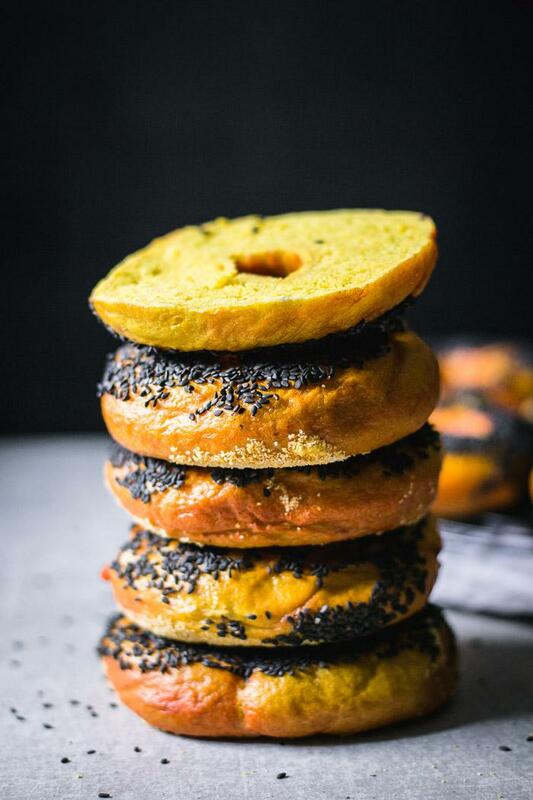 Not the typical New York style bagels, but similar – chewy turmeric bagels with some amazing black sesame seeds on top. I’ve added a bunch of turmeric in the dough, which gives it such a beautiful vivid golden color and a nice aroma along with a hint of bitterness. And the black sesame is just awesome. It has a stronger taste than the lightly colored sesame and it contains a whole bunch of necessary minerals. 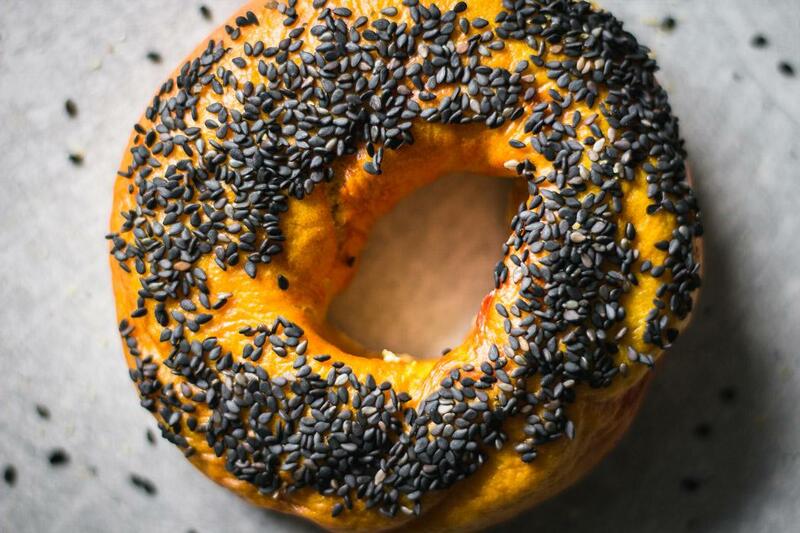 One thing that makes bagels different from normal bread is that we’re using less yeast, which gives it some extra flavor and dense texure inside. We don’t want the bagels to be bready, but rather chewy and moist. Cooking them in water infused with baking soda will make the crust seal and prevent it from rising more in the oven, which will also help create the dense middle and will give the crust a nice darker color. 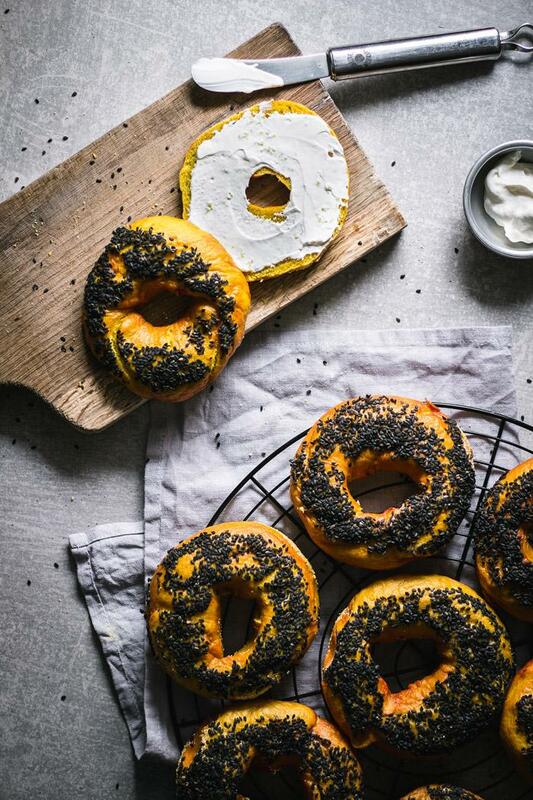 Actually in this case, because we’ve added turmeric to the dough it will become sort of orange or red in some places, so don’t get scared, nothing’s wrong 😛 It’s just more fun! I like to serve bagels with cream cheese or some creamy beet dip with smoked salmon and some leafy greens like spinach or arugula. In a bowl of your stand mixer combine 3 cups of flour, all the water and yeast using a whisk. Cover with a cloth and let rise for 30 minutes. After 30 minutes you will see bubbles on the surface of the dough mixture. 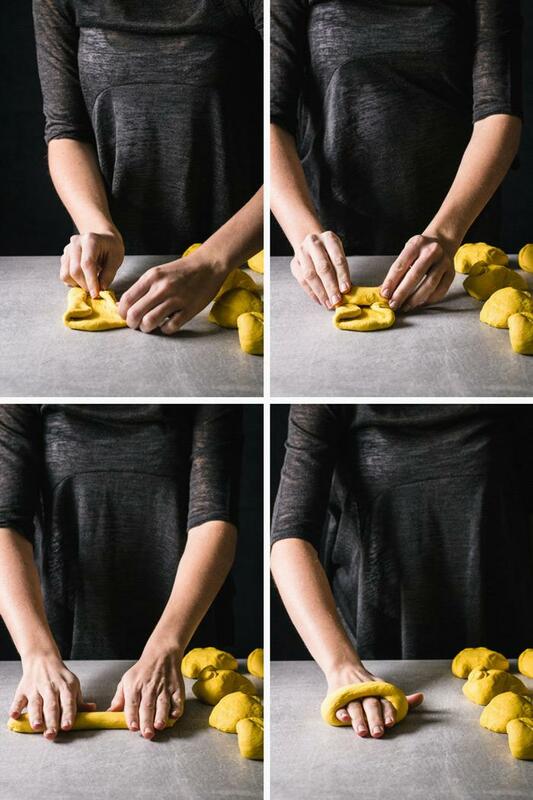 Add the remaining flour, turmeric and salt and using a kneading attachment start kneading the dough. Knead for about 10 minutes, then cover the dough with plastic foil and leave to rise in a warm place for about 1 hour and 30 minutes or until it has doubled in size. Punch the dough and give it a couple of kneads. Divide the dough into 90-110 g chunks. Flatten each piece with hands fold in the sides and roll so you get a cylinder (like a spring roll). Using the palms of your hands roll out the cylinder to about 20 cm long, then overlap one end over the other, pinch hard and use your palm to roll these two ends together. Let rise covered with a cloth for an hour. Bring water with baking soda to a boil in a wide skillet. Let it gently simmer while you cook the bagels 60-90 seconds each side. 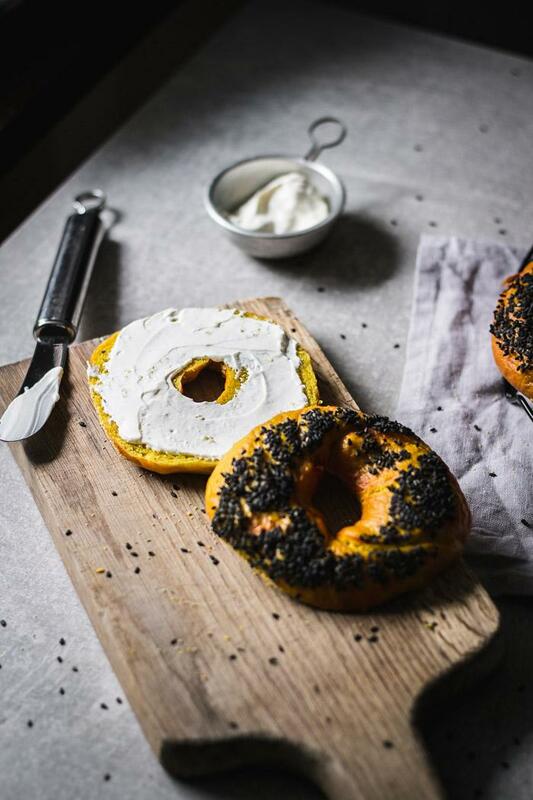 Drain and dip one side of the bagel while still a little wet in black sesame seeds and the other in cornmeal. Place on a tray lined with baking paper and bake for 20-25 minutes at 220°C until you get a nice golden and red color. Don't overcroud the bagels in water, because they will rise a bit and they may change the shape if they touch other bagels. 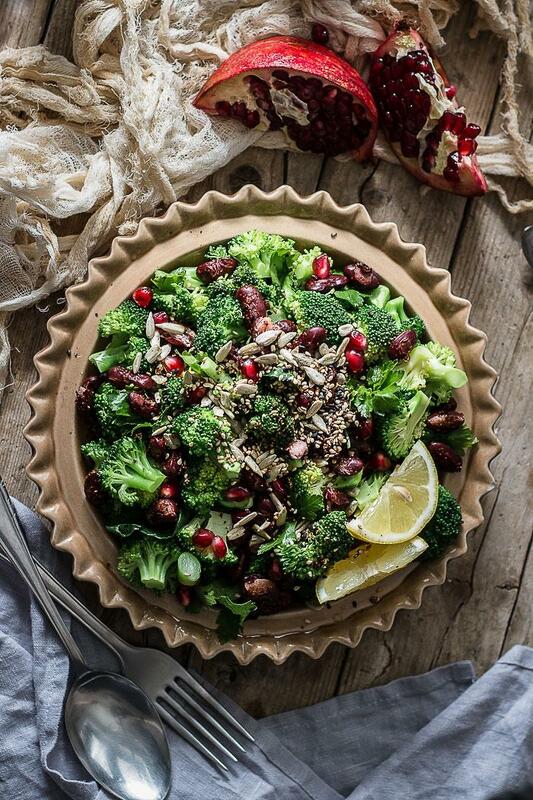 Whoever says comfort food can’t be healthy, has obviously never tried popped beans and steamed broccoli salad with toasted spicy nuts and lemony mustard dressing. Hungry anyone? Hey, hey! We’re having broccoli today. I have a habit of steaming broccoli instead of roasting them. I dunno, I think it’s because of the vivid green color it keeps. Plus, it’s quicker 🙂 I was thinking what would go well in a steamed broccoli salad and then I remembered a Jamie Oliver show from a while ago. Can’t even remember the recipe, but I know he roasted the beans on a pan until they started popping. I tried those before and they were great. So, it sounded like an awesome idea to add them to the broccoli. 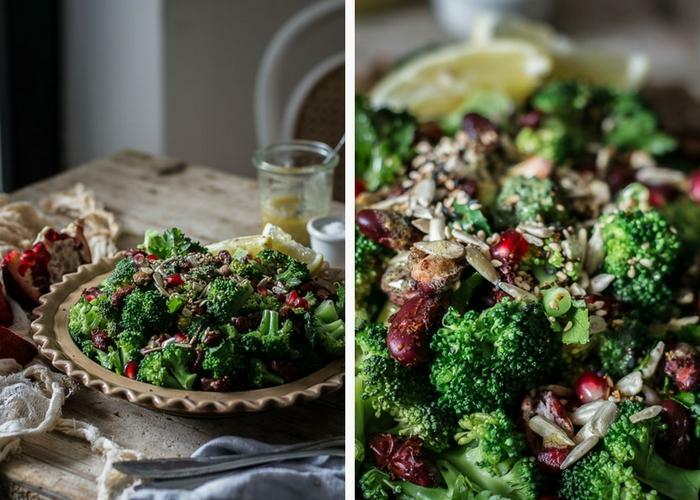 Turnes out it was the right decision and with some added chopped parsey, pomegranate seeds and spicy nuts this makes a perfect winter salad. 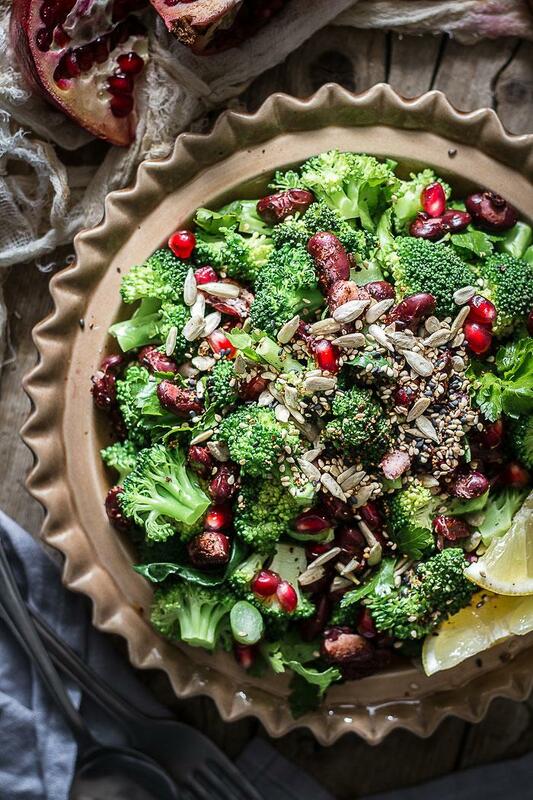 The best thing about this salad is, it can be both a warm or a cold salad. 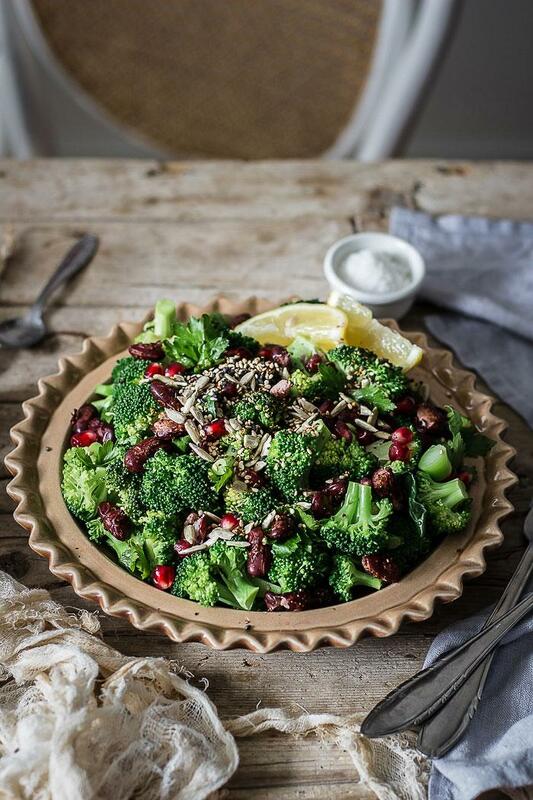 For a warm salad, you dress it while everything is hot, for a cold salad, you rinse the broccoli with cold water after steaming and then decide if you want the beans and nuts to be warm or not. It’s up to you! I’m seriously obsessed with mustard dressing. Although I’m normally not a fan of mustard as a condiment, it’s so amazing if you use it as seasoning. 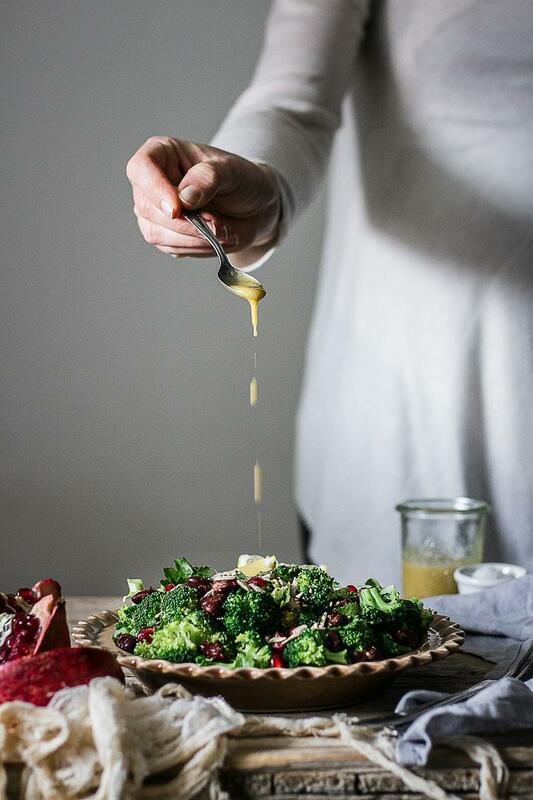 This dressing is probably the one I use most on daily basis, because it’s super simple and mustard gives it an extra depth and richness. It works really well with bitter winter salads like radicchio. Besides all the baby preparations, we’re also starting to prep for the new dance show that we moved from Spring to Autumn, because of… well, baby. Yesterday, I started making my part of the coreography. You can imagine a big belly and a fast dance + some floorwork. It was fun, but also very chalenging! Great, your all updated now, so let’s start cookin’! 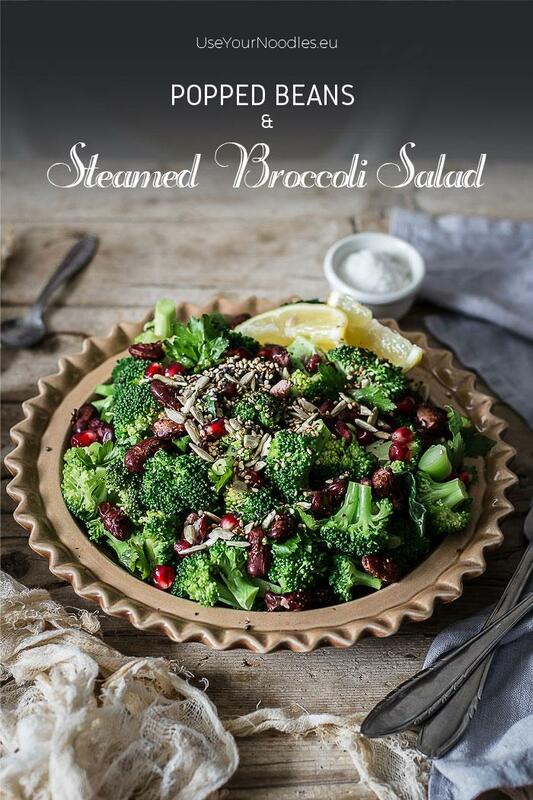 Steamed Broccoli Salad: Cut the florets away from stems and cut them into bite size chunks. Cut the thinner stems into 1 cm chunks. Peel the thick main stem and cut it into 1 cm cubes. Boil a little water (about a finger's width) in a steaming pan and add the steming basket. Place the stem parts of broccoli into the steaming basket and the florets on top. If there are any leaves from broccoli place them right at the top. Cover with a lid, reduce heat to low and cook for about 5 minutes or until you can easily pierce the broccoli with a fork, but it's still vibrant green. 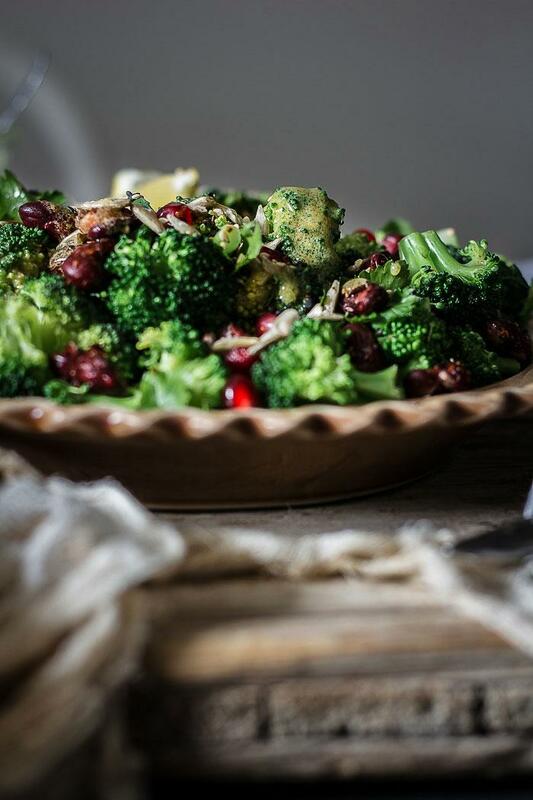 Be careful, because broccoli can go from vibrant to brownish color quickly. If you prefer your broccoli to be cold, rinse immediately under cold water to stop it from further cooking. If you're serving it warm, just remove from steamer and let it drain. In a bowl mix together garlic and chilly flakes. Heat a big skillet over medium-high heat and add beand and half of the garlic and chlli mixture. Cook them for about 4-5 minutes, tossing every now and then. Once you see most of the beans open, add the nuts and toss every now and then for a minute. Remove from heat and add the remaining garlic and chilli mixture. 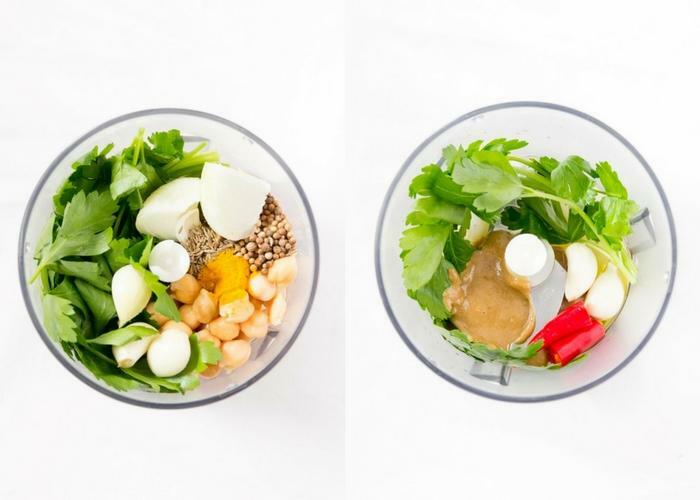 Lemony Mustard Dressing: Beat all ingredients together with a fork. 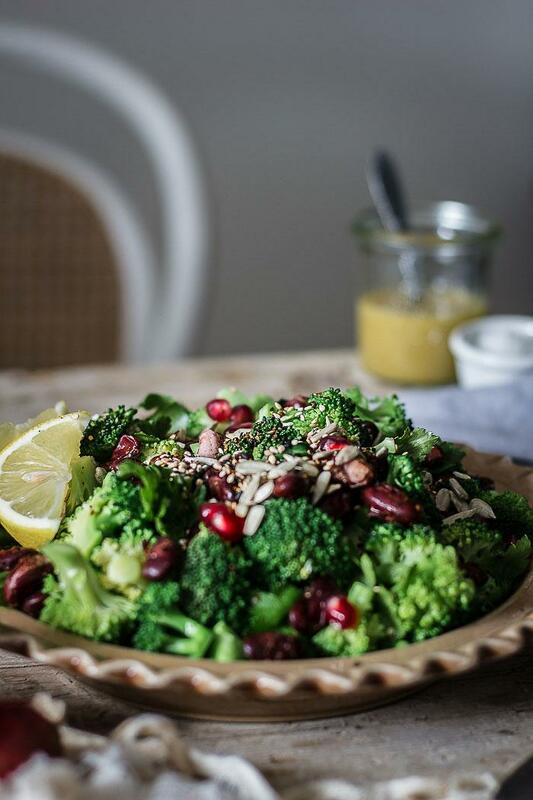 Steamed Broccoli Salad: In a salad bowl, mix together broccoli, parsley, 2/3 of beans and seed mixture, 2/3 of pomegranate seeds and dressing. Top wih the remaining 1/3 of beeans and seeds and the rest of pomegranate seeds. 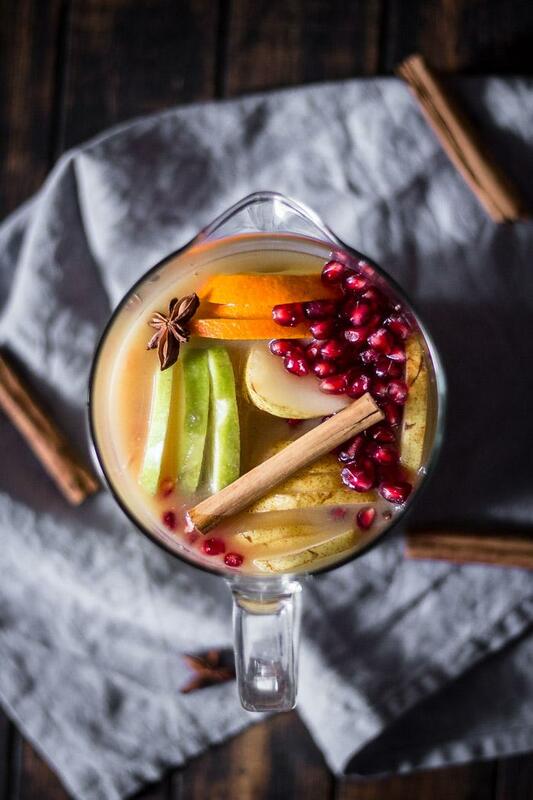 I love non-alcoholic festive sangria, especially when it tastes like winter with all its beautiful mixed fruits and Christmas spices. It’s the easiest thing in the world to do and you can prepare it ahead of time. 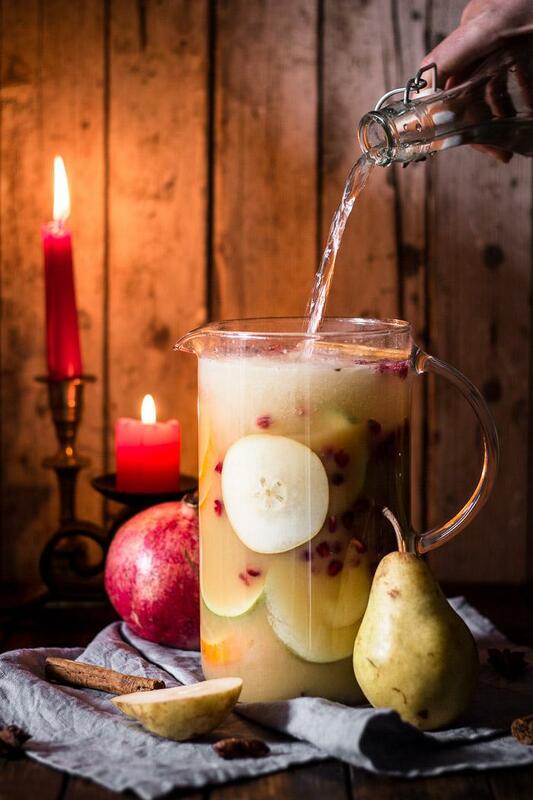 Anyone up for a festive drink? I know, I know, it’s not Christmas yet, but we’re slowly getting in the mood. I’m already making plans for Christmas baking and seeing some lovely Christmas market. Oh, I love those! I’m not a fan of crowded places, but Christmas markets are an exception. They don’t really make sense if you’re there all alone. The great thing about them is the smell. The smell of spices and sugar accompanied by Christmas lights and friends. I don’t know if you guys remember, but I’ve been angry about Christmas stuff being in the stores and on the streets way too early in one of the last years post. I’m over it this year… can’t really wait for December to come with all its perks. 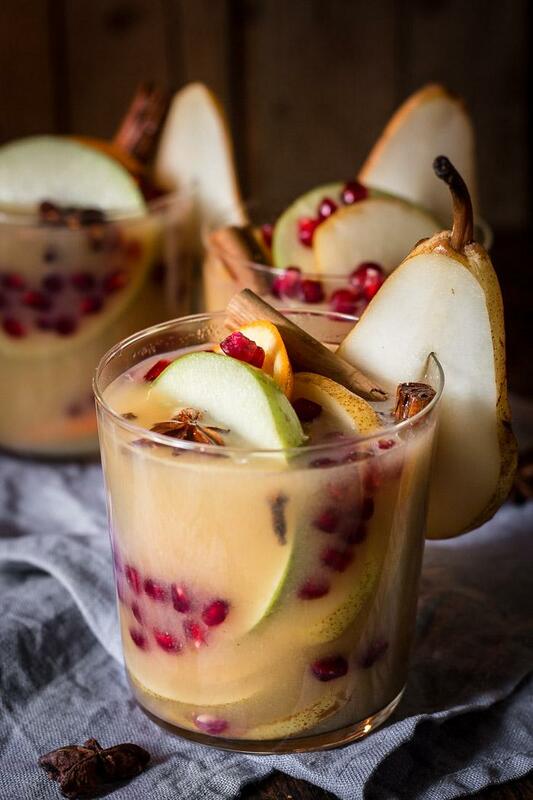 Alcohol lovers, there’s none in the recipe, but if you’re up for a boozy version, you can try adding wine or some fruit liqueur. 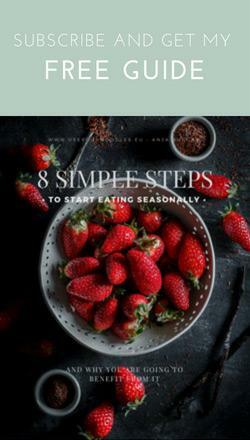 I love simple and quick recipes! 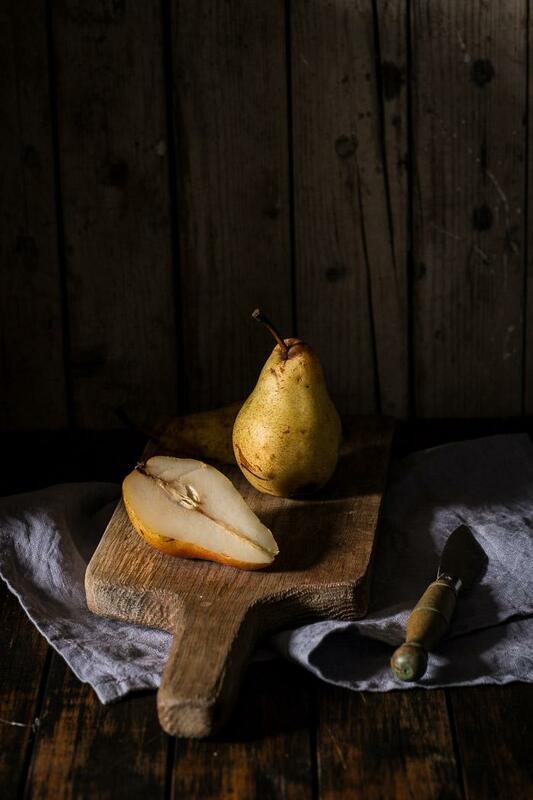 Slice pears, apples and oranges into 3mm slices or chunks as big as you like. 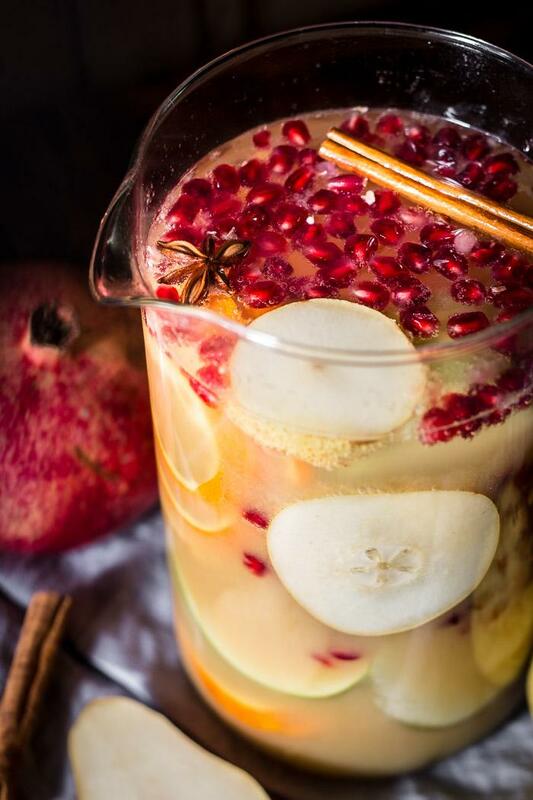 Place all fruit, cinnamon sticks, star anises, ginger, peppercorns and cloves in a big bowl or a jar and pour over pear juice. Keep in the fridge for at least 5 hours or overnight. Before serving add cold sparkling water. 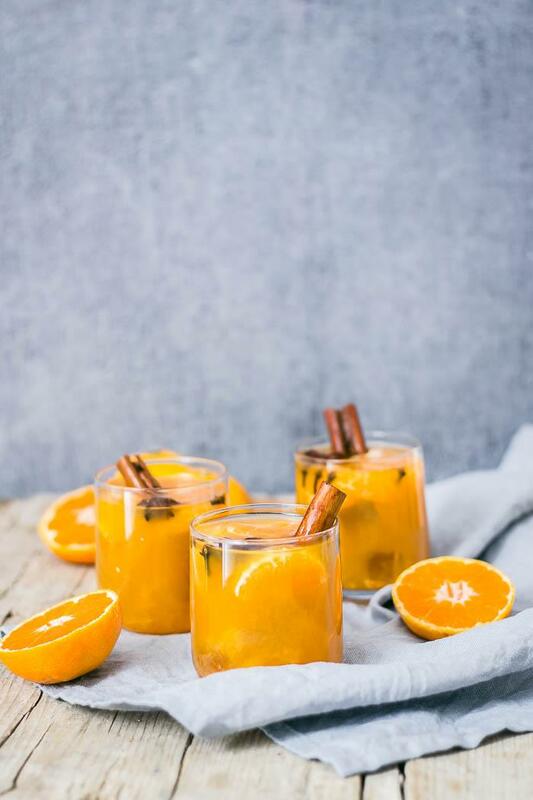 Easy to make from scratch warm autumn mulled mandarin juice! With tons of mandarins. I mean I probably ate a few kilos of them. And I’m not exaggerating at all! I’m feeling much better now and ready to bring you another awesome recipe. 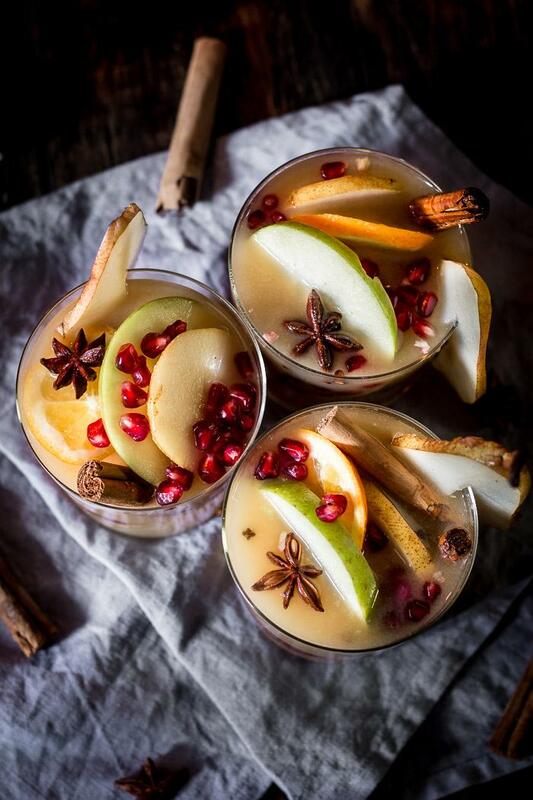 Inspired by mulled wine and apple cider, I decided to give warm drinks a little twist. I’ve added mandarins to those two drinks before, but never tried cooking mandarin juice on its own. And man, I’m sorry I didn’t!! 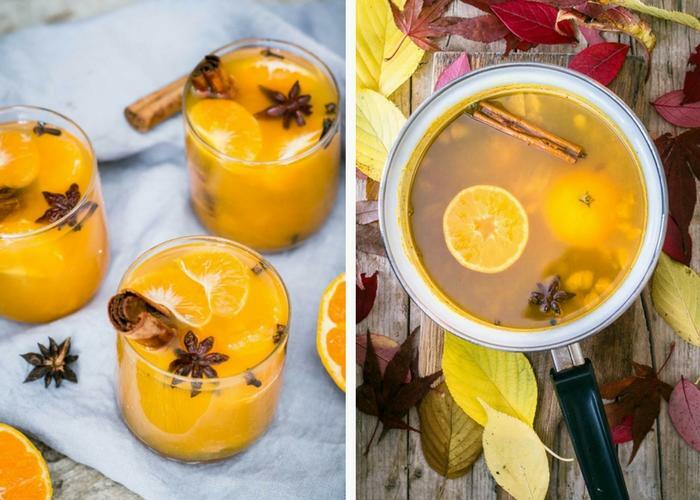 Don’t get me wrong, I love mulled apple cider, but it needs lots of lemon to reduce the sweetness. Well, not mandarins. Especially the sour ones. 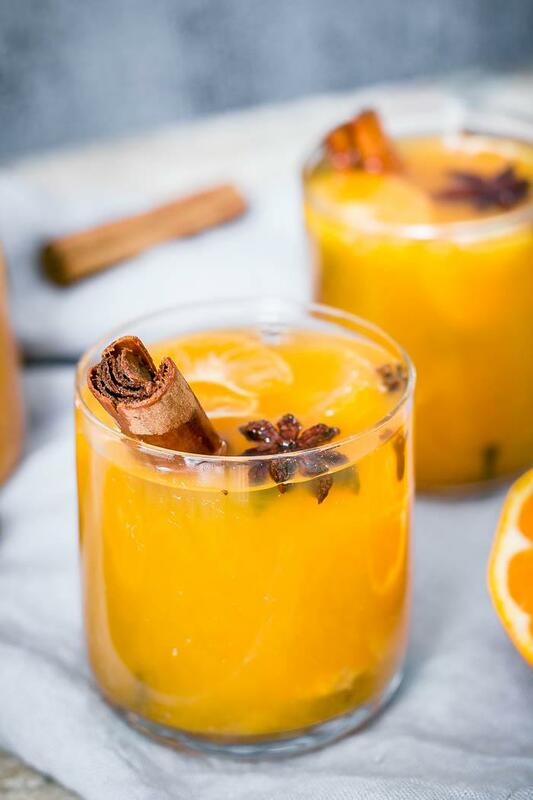 Which are my favorites, btw 🙂 There’s just a little honey or any other sweetness necessary in this recipe, or if you prefer sour drinks like me, you can omit that. Now that we got this straight, let’s talk spices. And it made me so happy I just had to share this recipe with you. I have a feeling mulled mandarin juice is gonna be my everyday drink now. Since being pregnant means, I have to be careful with what kinds of teas I drink, I was also out of warm drink options. This will be perfect to spice things up. 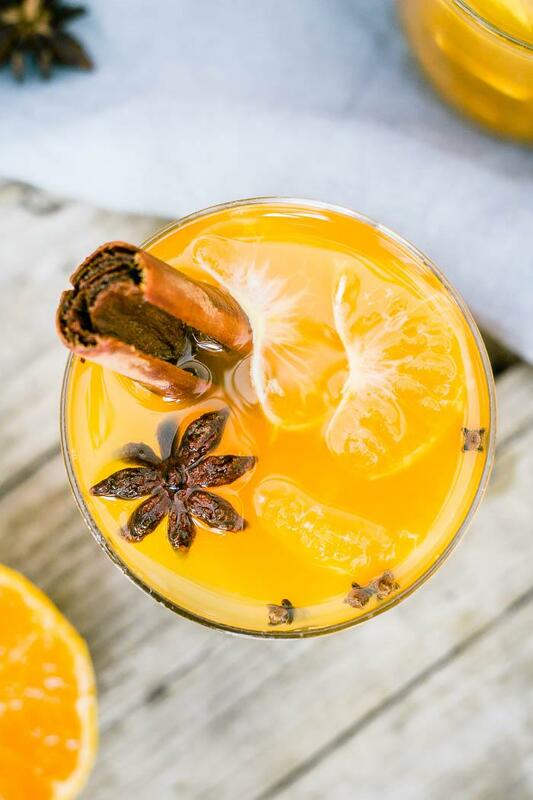 I want to hear everything about your other favorite winter drinks in the comments below. And if you want to boost your immunity, so you don’t get a cold like I did, try some Immune-Boosting Elderflower Turmeric Tea. Add all ingredients to a pot and place over high heat. Bring to a boil, then cover and reduce to low heat. Cook for 20 minutes. Remove from heat and serve hot. 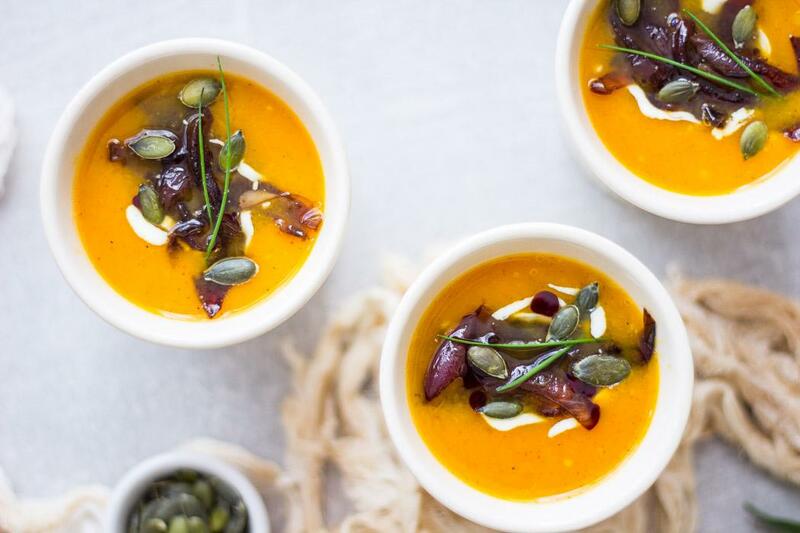 Warm, sweet and spicy pumpkin soup will be your new favorite autumn comfort food! Omg, it’s been so long since my last post. So sorry for that, but I’ve had a perfectly good reason. Actually the best reason in the world. We’re having our first little baby in April! 🙂 ♥ How awesome is that! I still can’t believe it’s happening, but we’re happy and excited and can’t wait to meet our tiny bundle. 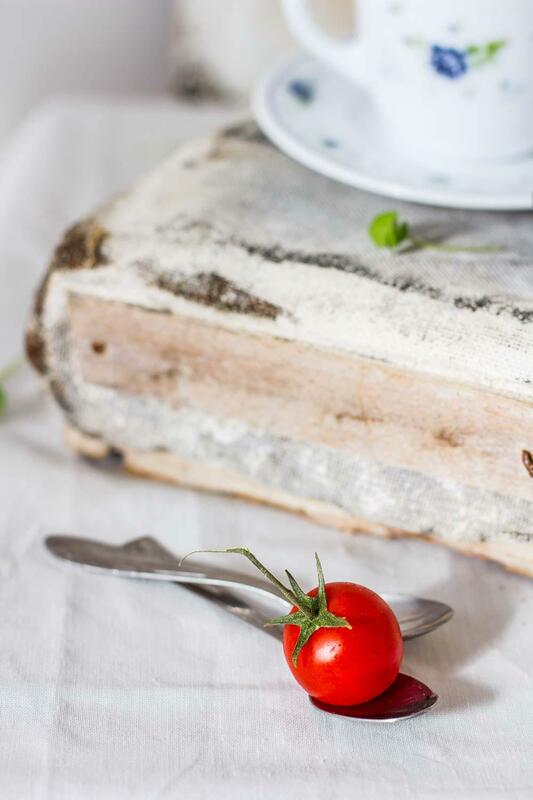 I haven’t had any major pregnancy discomforts, but one that affected my blogging: I wasn’t able to cook for a month or smell any strong smelling food. Or look at food photos. I’m still struggling with fresh veggies (which I would normally love so much! ), but most of the troubles went away now that I’m in my second trimester. I’ve been craving sweet food a lot. 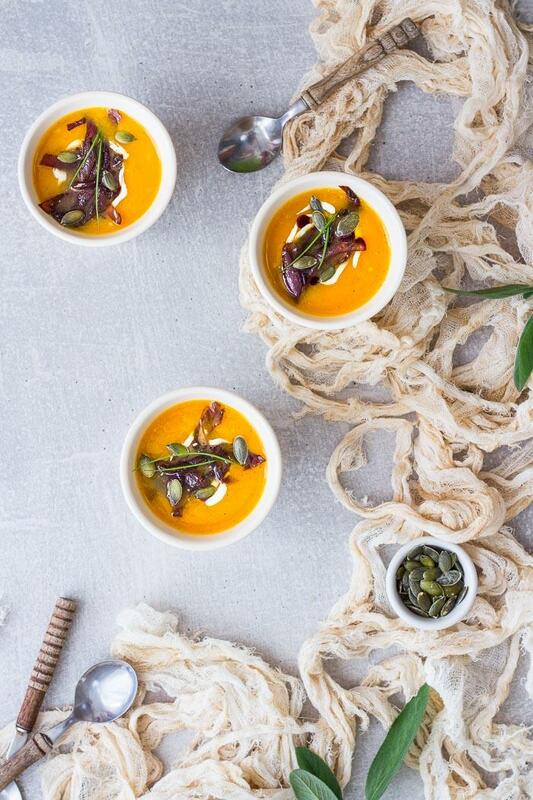 Not sweets, but sweet savoury food like root veggies and pumpkins. So they’re on the menu a lot these days. 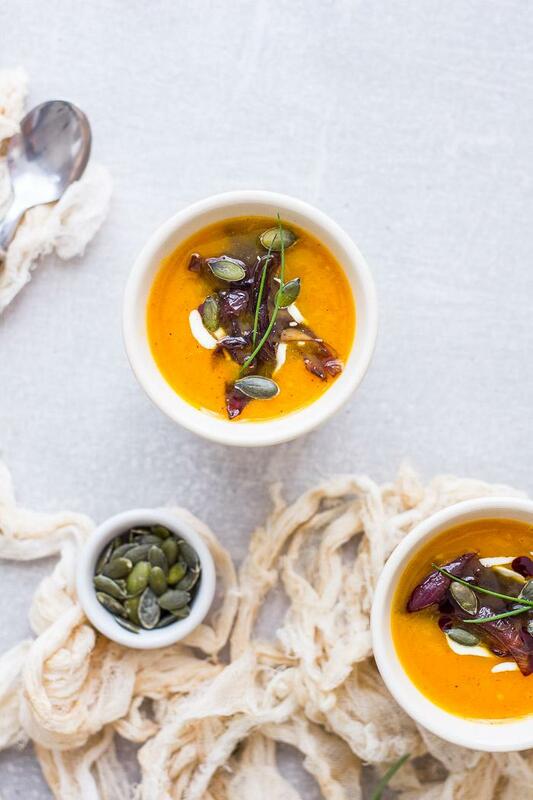 One of my all time autumn favorites is definitely pumpkin soup. 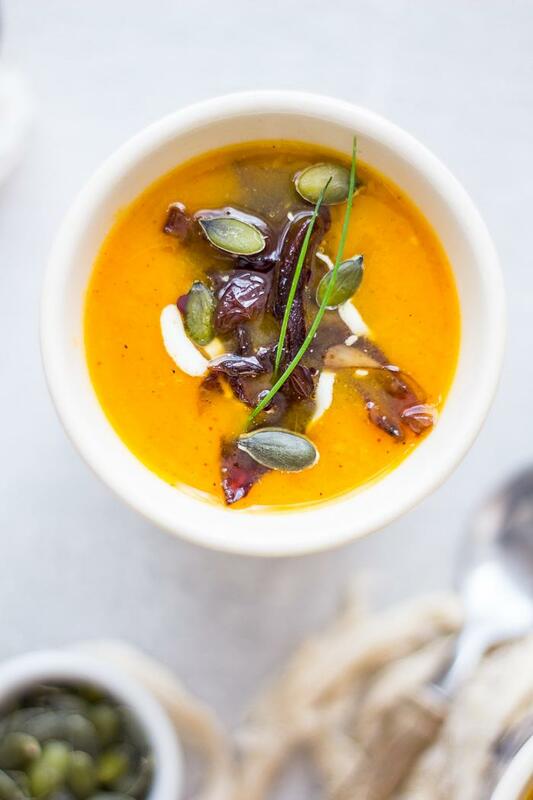 What makes pumpkin soup so amazing is its natural sweetness in combination with chillies. 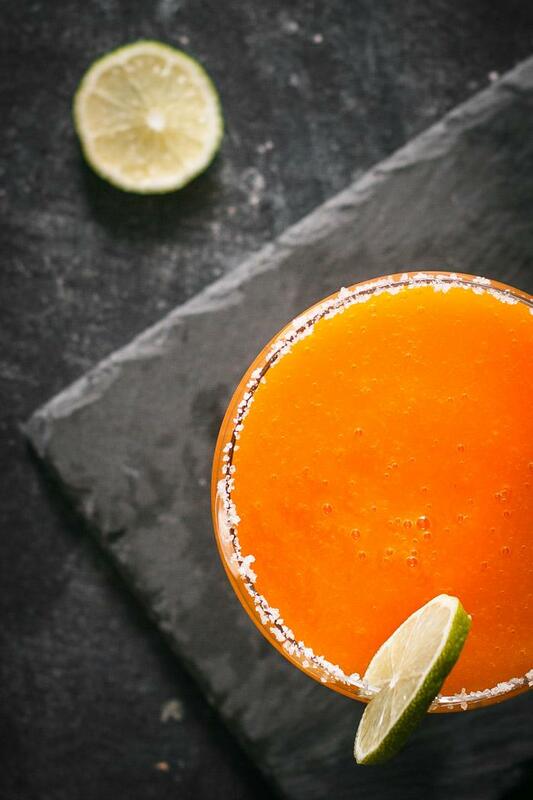 Remember how chillies go perfectly with chocolate… well, it’s the same with pumpkin. So don’t skip on it. Seriously! Add less if you’re not into spicy stuff, adding at least a little will make all the difference. I don’t like adding much to my simple pumpkin soup recipe. No stock or herbs. Water, garlic, chilli flakes, salt and pepper are enough. I’m using pumpkin purée as my base. If you’d like to make your own check the notes in the Mini Pumpkin Pizzas recipe. A good variety of pumpkin or squash is crucial, so pick one that you absolutely love. For me that’s hokkaido or any other with simmilar sweetness. 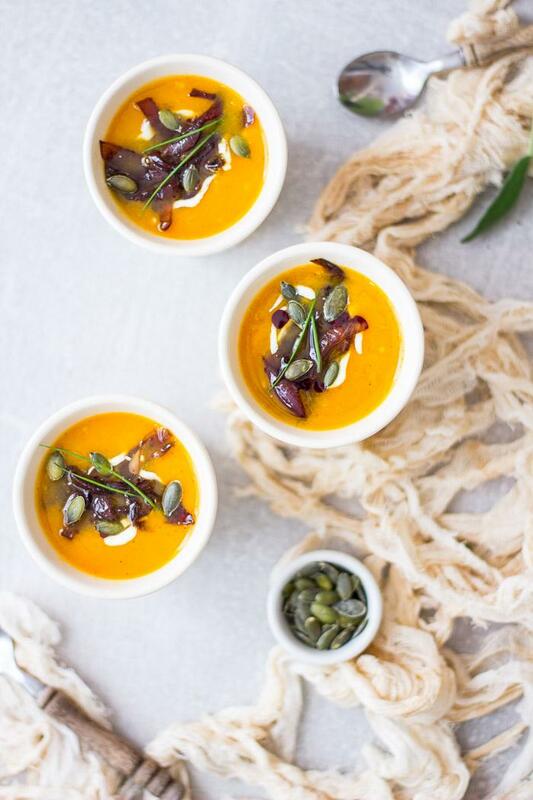 A very sweet pumpkin soup like this need a counterbalance, so I added balsamic glased onions with sage on top. I could eat these onions on their own, they are sooooooo good. I’m letting you in on a little secret. I’m dreaming about autumn all year round. I love all seasons, especially when they’re just starting. All the fresh new produce and the feel of change. 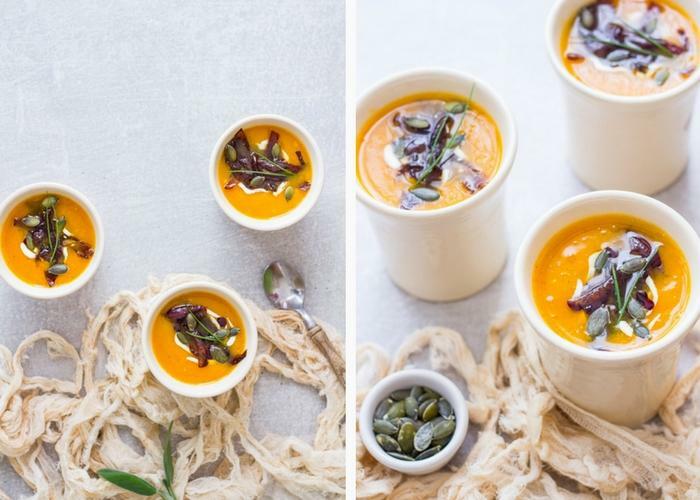 Now I’m off to warm myself with a bowl of this delicious pumpkin soup! Cut the onion in half and remove the skins. Slice it into 3-5 mm thin slices. Place a skillet over medium heat and add olive oil. Add the onions and sage and stir to cover them with oil. Cook uncovered for about 10 minutes stirring occasionally, until the onions get translucent and a bit softer. Add water, balsamic vinegar, salt and pepper and cover the skillet. Continue cooking over low-medium heat for 20 minutes or until the onions get soft. Uncover and cook over medium-high heat for additional 5-10 minutes to lose the excess moiture and caramelise the onions. Stir occasionally to check they are not burning. Place a pan over medium heat and add olive oil. Add garlic and cook until it gets golden. Add pumpkin puree, water, chilli flakes, salt and pepper and continue cooking until the soup boils. 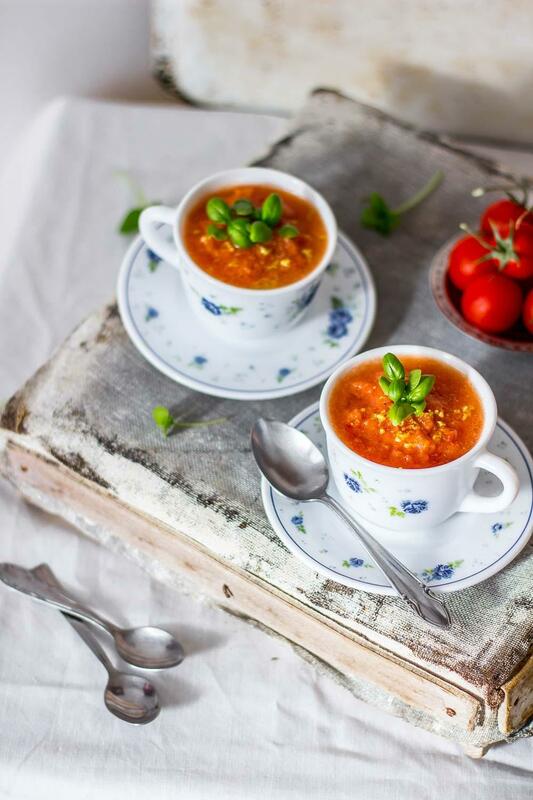 Pour hot soup into bowls and decorate with balsamic glased onions. You can add crème fraîche, pumpkin seeds, pumpkin seed oil and chives if you like. No icecream machine, no problem! 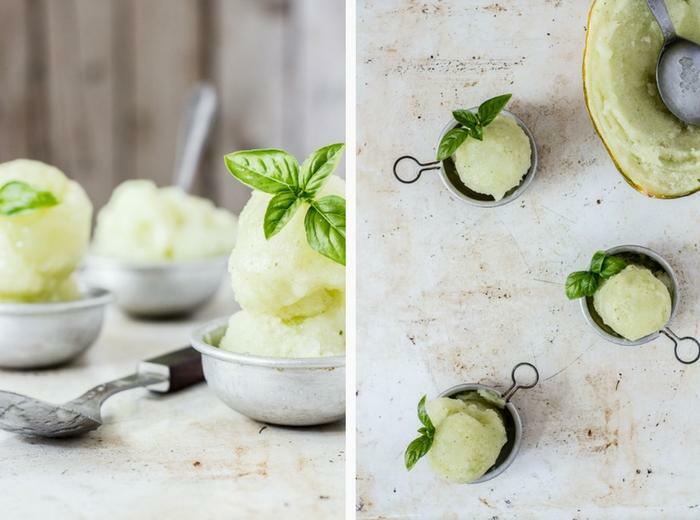 This super easy two ingredient melon sorbet needs no icecream machine, but is creamy and delicious anyway. 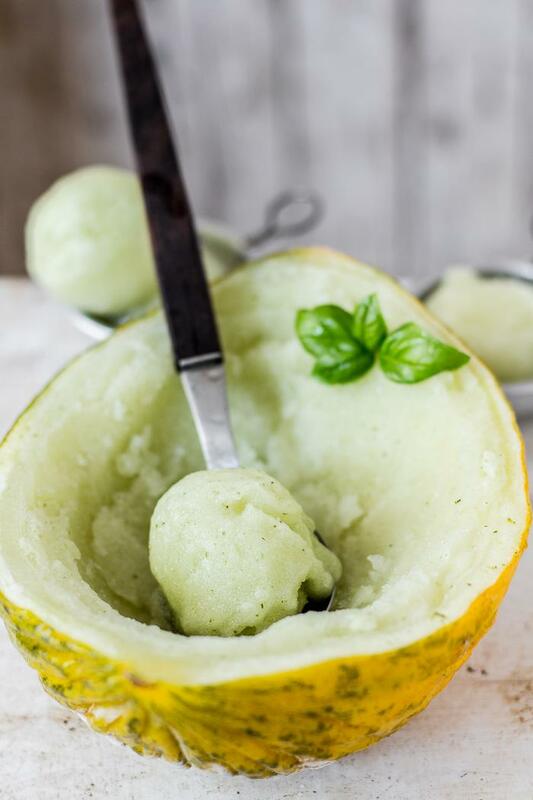 Super creamy and rich melon sorbet spiced with just a hint of basil. I can’t believe something so good can come out of freezing a simple fruit like melon. Yup, that’s right, I just described the entire recipe. But, really it is that simple. I was never a big fruit person. I mean, I loved the taste, but somehow I wasn’t very fond of biting into them. And most of all, you don’t really need all that much. Mostly just fruit, some water, if the fruit doesn’t have high water content, maybe some sweetener and that’s it. 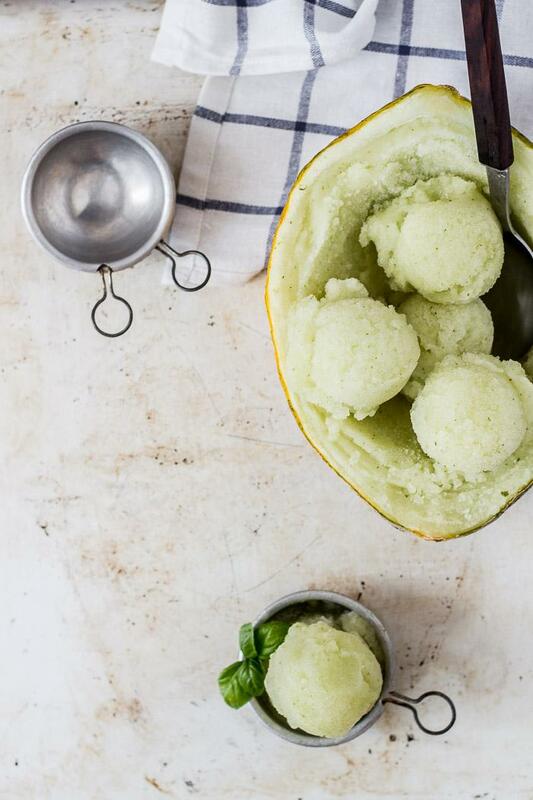 Why I love this melon sorbet? 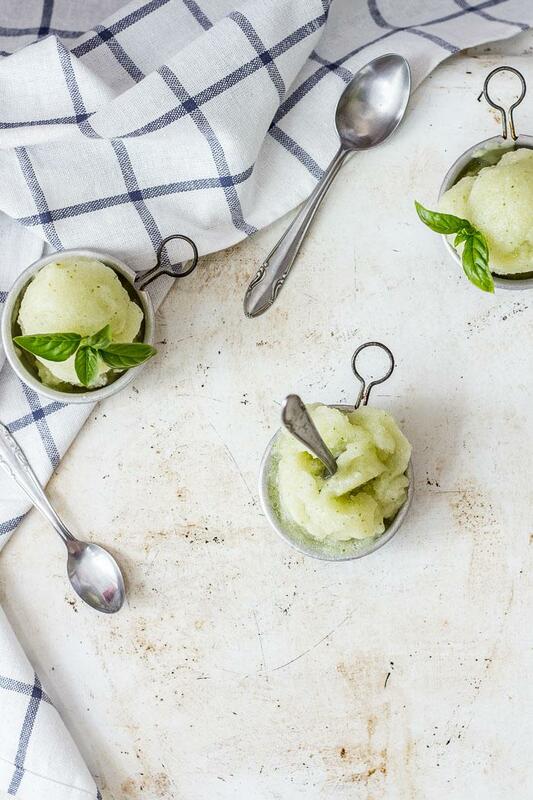 Because it’s made only with melon and basil. Melon is made mostly of water and you don’t need to add extra. If the melon is ripe enough it is so sweet, that it doesn’t require any extra sweetening. 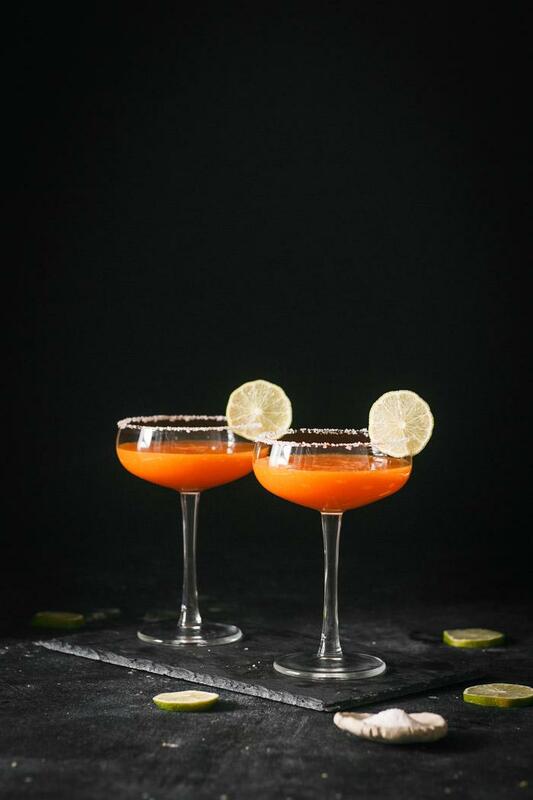 Oh, how cool does it look when you serve it in a melon shell. Awesome for a garden party 🙂 You can freeze it in a shell directly if you are serving it immediately or transfer in to the shell right before showing it to your guests. I’m getting hungry! Are you? 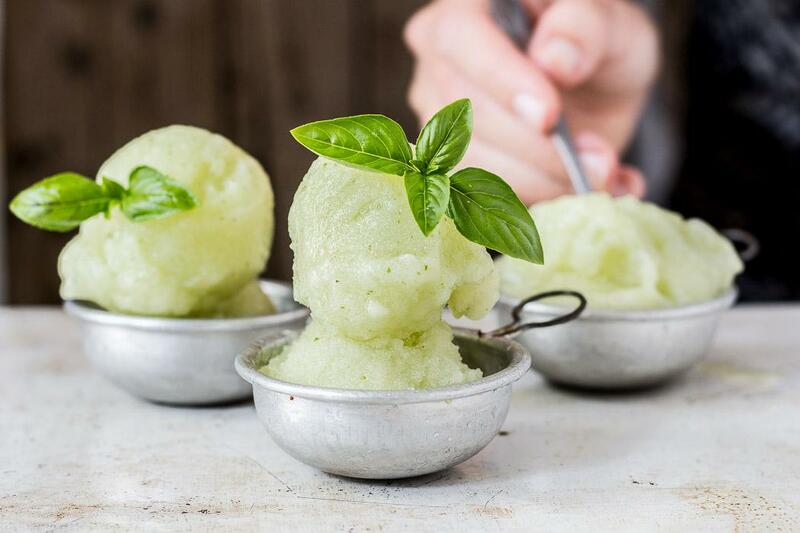 Place the frozen melon chunks and fresh basil into a food processor and pulse until coarsely chopped. Keep beating until you get a smooth and creamy consistency. Transfer to an airtight container and freeze until firm, for about 3-4 hours. 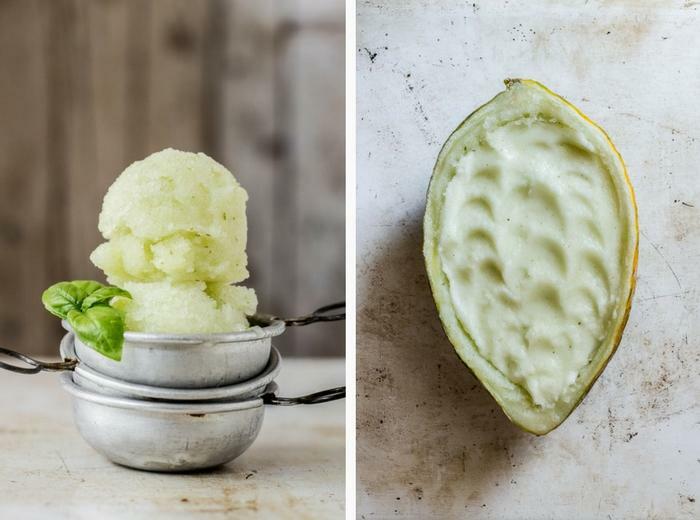 If you have an icecream maker, prepare the mixture without pre-freezing the melon. Cool it in the fridge for an hour and make it as per instructions. 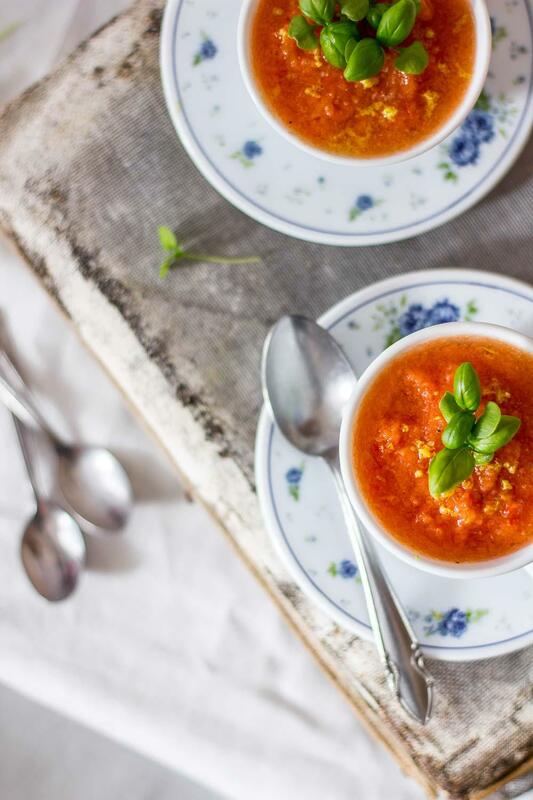 This easy lemony tomato gazpacho recipe will save the hot days, when you don’t feel like cooking. I love watching my tomatoes grow. It’s an obsession. Some people go for a morning walk in the forest, I take a stroll in the garden to check what’s grown overnight. So now I’m anxiously waiting for my tomatoes to ripen and then I can eat them like apples. That’s my favorite way! 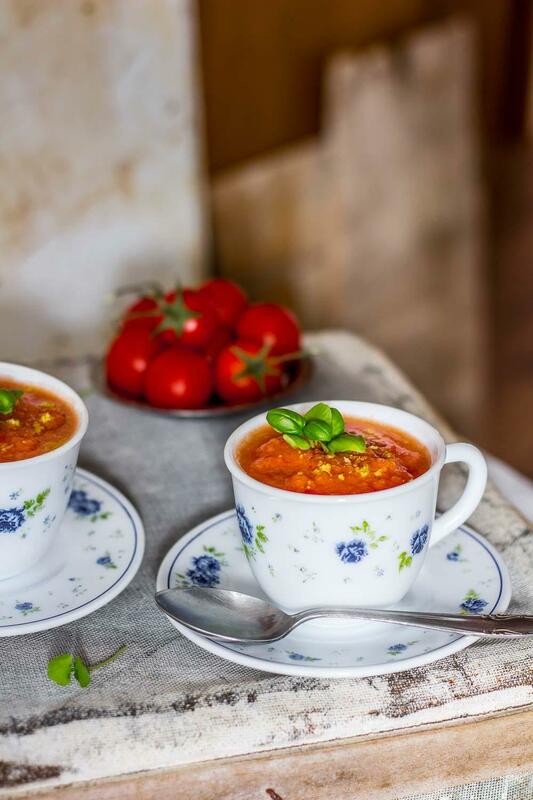 A while ago I attended an awesome workshop organized by the culinary & lifestyle magazine Radegunda and guess what… all the dishes we were making were based on tomatoes. We were making all kinds of stuff… and eating them, which was the best part, for sure! 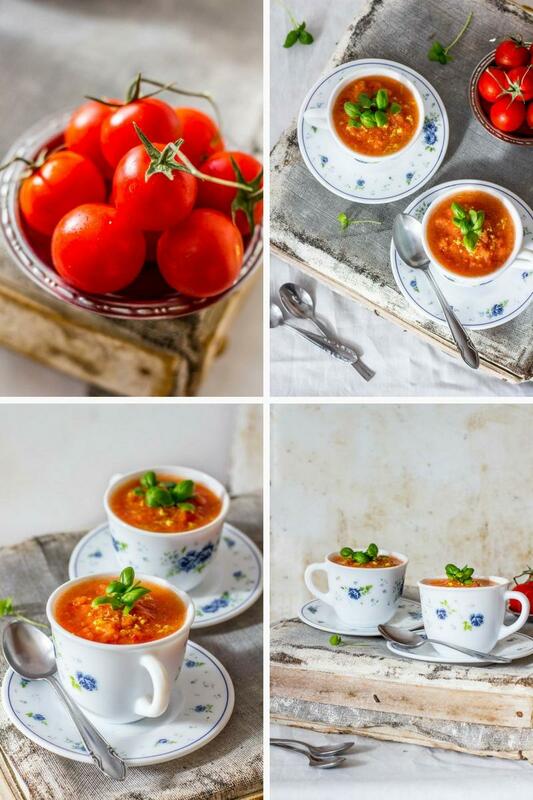 Inspired by the workshop and the anticipation of homegrown tomatoes I created this simple 5-minute tomato gazpacho. Head on to the fridge or the garden, whatever’s closer, and get some fresh vegetables. 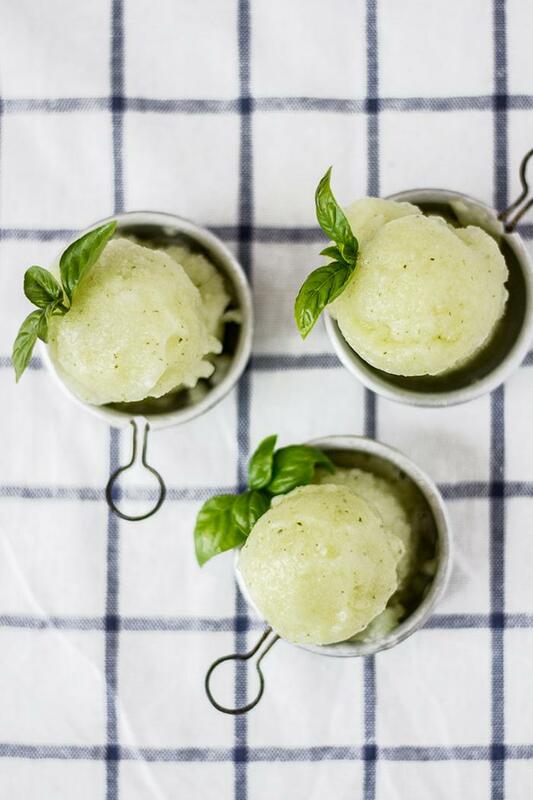 Chop them up, blend for a minute or two and you’ll get the most refreshing lunch you’ll have this summer. Best part of this recipe is the lemon zest. It makes all the difference. Don’t skip on it, but be sure to buy organic lemons. Chop the vegetables into chunks. In a blender, mix together all ingredients, until you get a smooth soup. Pour into cups or bowl and serve cold. Keep the vegetables in the fridge for a couple of hours before making the soup. 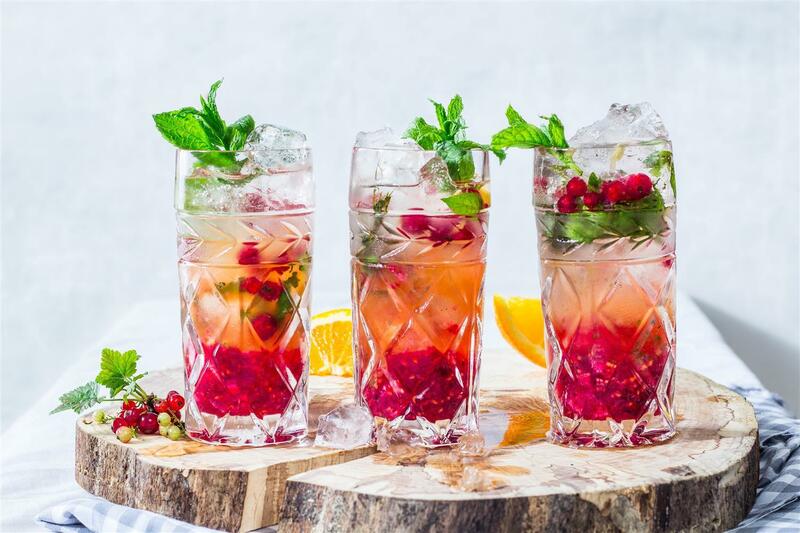 Perfectly refreshnig comfort summer drinks red currant, orange and mint mojitos! So join me for a glass of delicious summer cocktail. 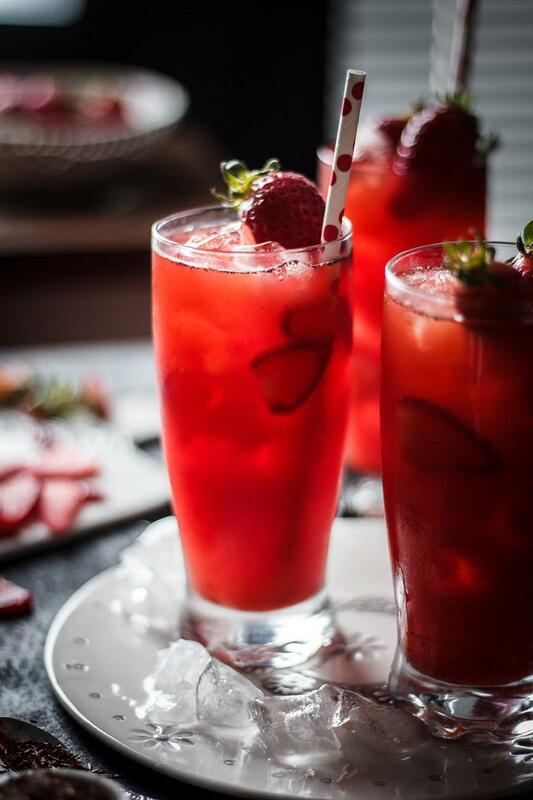 One sip and you won’t be able to stop. We love hanging out on our balcony listening to the birds in the cherry tree, playing board games, eating scrumptious chocolate brownies and drinking refreshing fruity drinks. 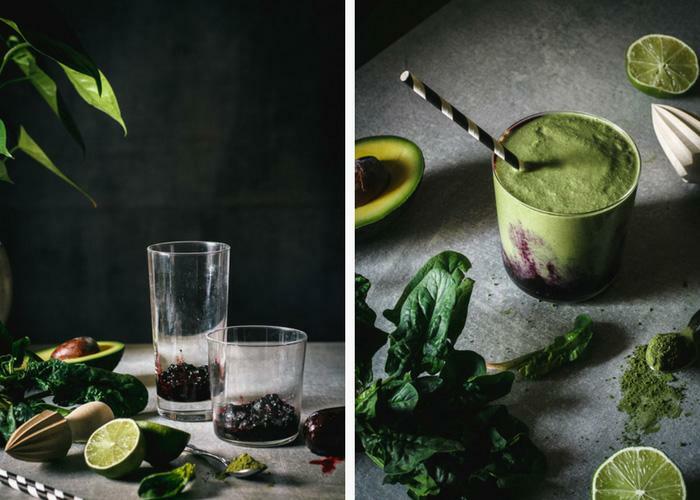 One of our favorite summer drinks is mojito. In any form. 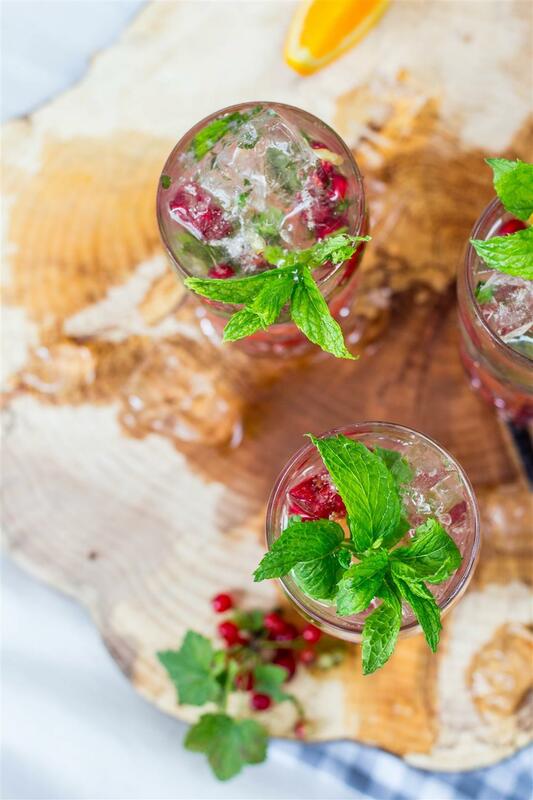 We usually drink a traditional lime and mint mojitos, but sometimes we make some changes. Like adding other seasonal fruit. 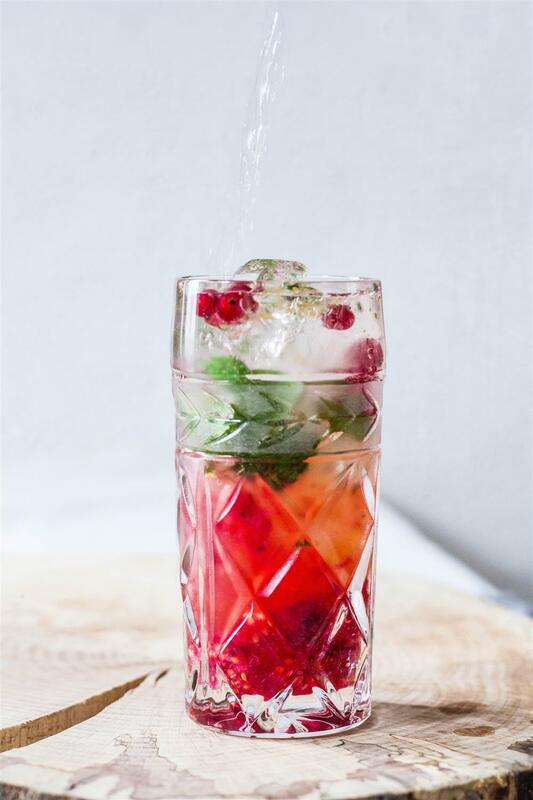 There’s a big bush of red currants behind the house, full of perfectly sweet and sour tiny fruits 🙂 So I replaced lime with red currant and got a super delicious and refreshing mojito. I added some freshly squeezed orange for some sweetness and the citrusy taste. The combo of red currant and orange is not something I’ve tried before, but I must admit they make a wonderful pair. Mental note to self – make cookies! 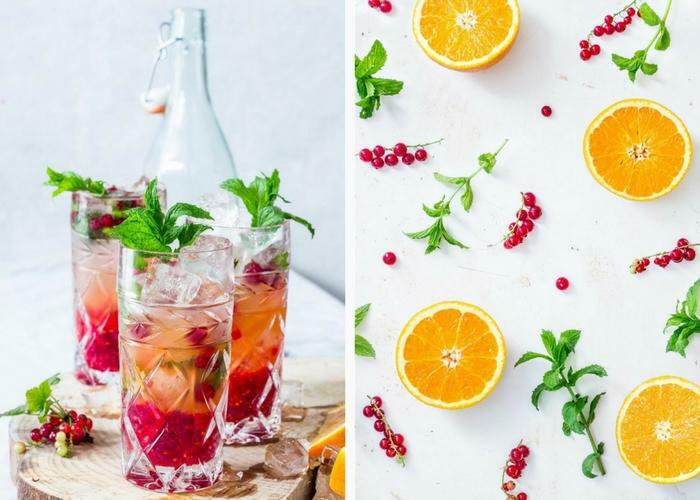 To make these lip-smacking red currant, orange and mint mojitos all you need is some fresh fruit, a bottle of rum, sparkling water and mint. And of course lots of ice! The recipe calls for fresh red currants, that you blend into a puree, which means you keep all of the goodies from the fruit. If you don’t mind about the little seeds, you don’t need to strain the puree. Now, let’s get the party started! In a blender, blend red currants to get a pureé. Use a muddler to crush mint to release the mint oils. Add 2 TBSP orange juice and unrefined cane sugar and muddle a little more. 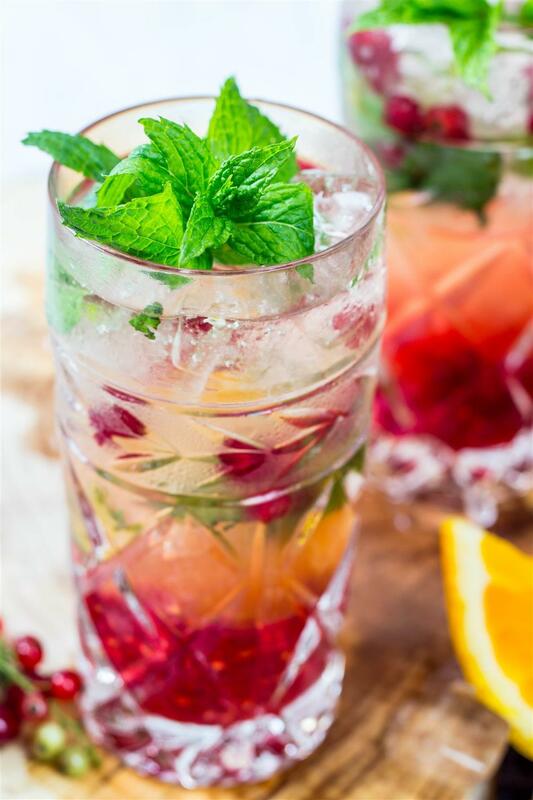 Divide red currant pureé into 4 glasses, add ice, mint mixture, remaining orange juice, white rum and sparkling water. 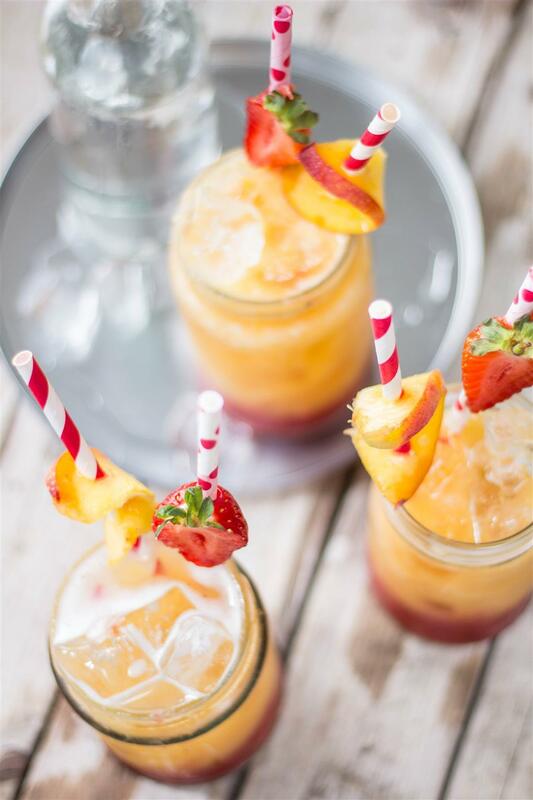 Mocktail version: Replace rum with orange juice. 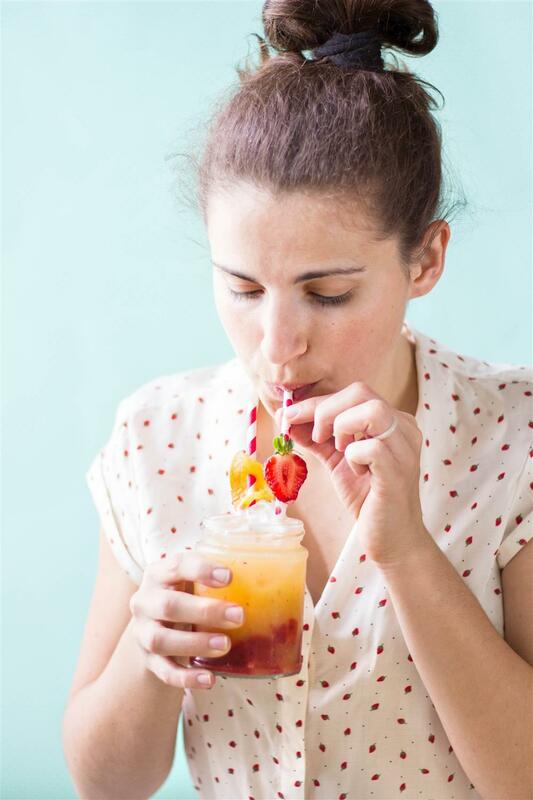 Delightful spring mocktail – roasted peach and strawberry fizz! 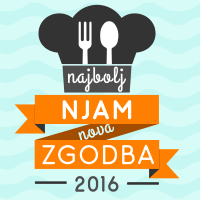 Yey, so excited about this recipe!!! 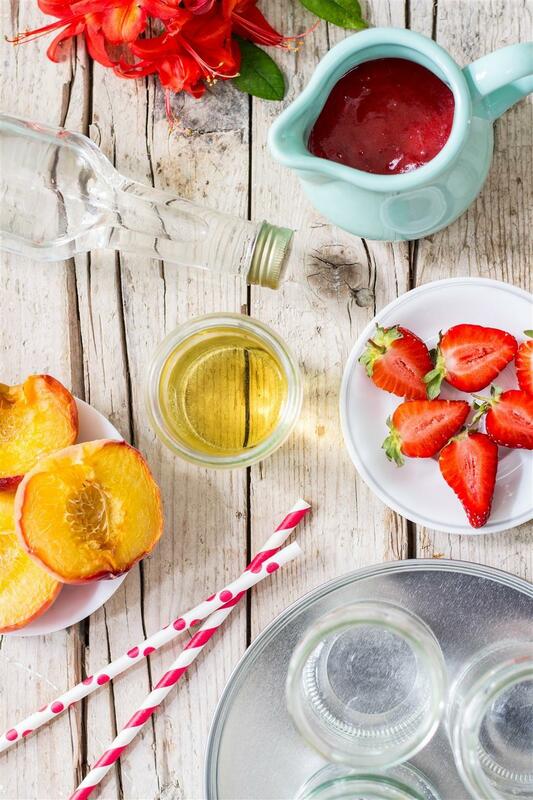 All you’ll need to do is cut peaches and strawberries in half, roast them and blend them. Then add a little apple juice, preferably homemade or organic, and some sprakling water. And there it is. While we’re on the spring subject. Spring has been awfull this year in Slovenia. Ugh, my tomato, pepper and chilli plants are barely holding on in thir tiny cups, just waiting to be planted outside. But its so COLD. I mean, I make drinks like this, just to feel like it’s spring. It’s a crime! But good news… Today it is sunny and we’re having a big picnic party for my brother’s and friend’s 30th birthday. Preheat the oven to 175 °C. Cut peaches in half and remove the pit. 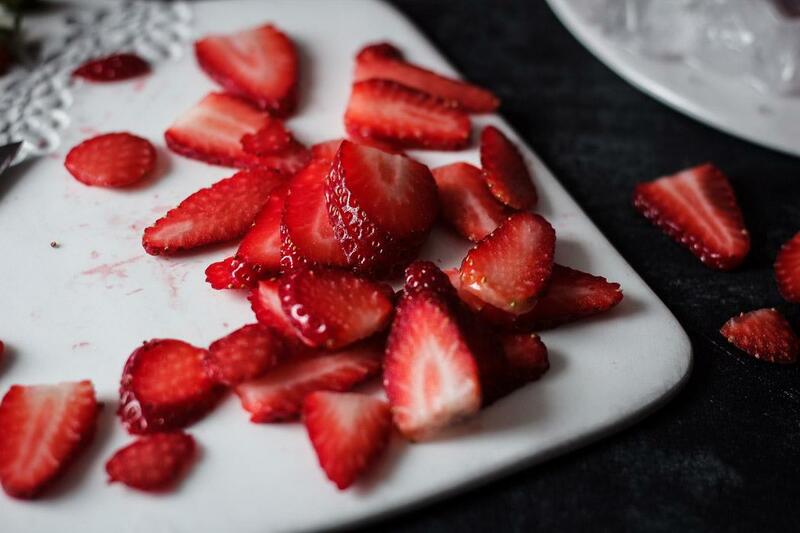 Cut strawberries in half. Place the fruit on a baking tray lined with baking paper and roast for 25 minutes. Take the tray out and leave to cool for 10 minutes or more. 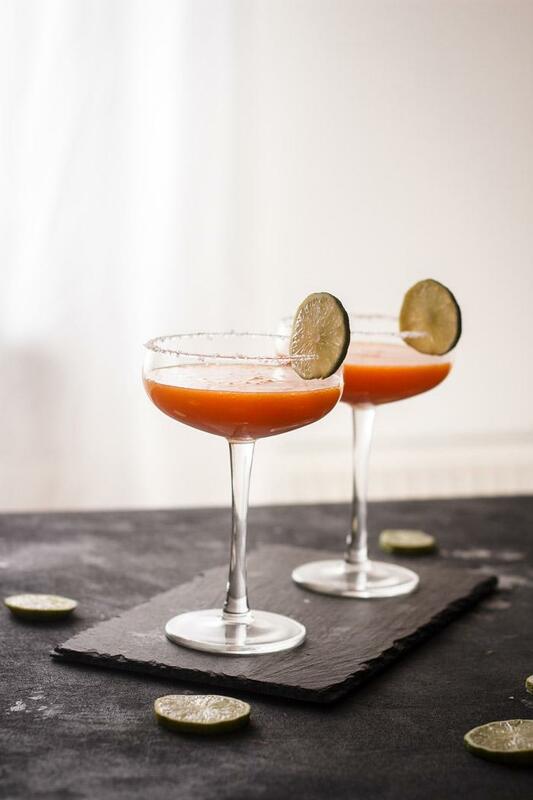 Remove the skins from peaches and blend the flesh together with apple juice in a blender to get a smooth pureé. 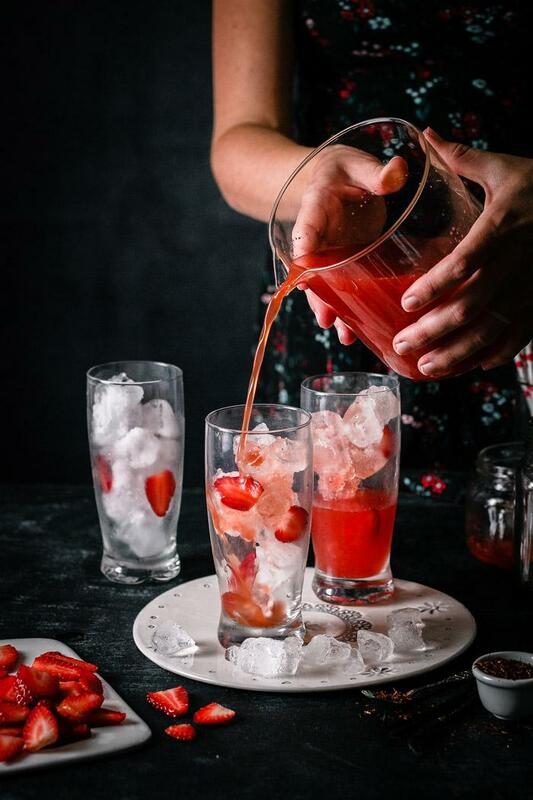 Divide the strawberry pureé into 6 glasses and add ice. 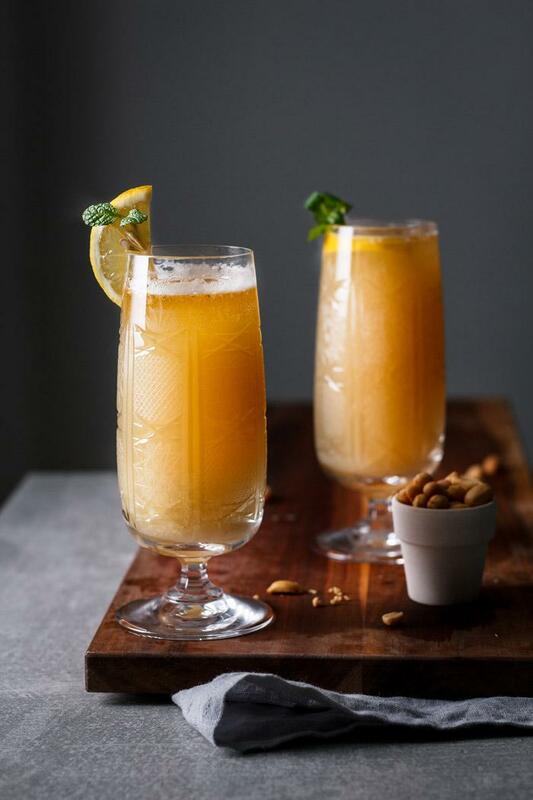 Pour the peach and apple juice mixture over ice and add sparkling water. 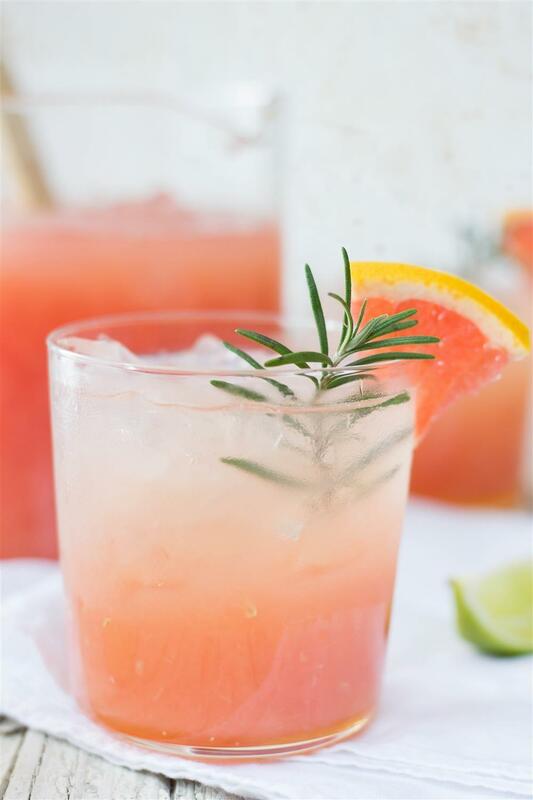 A cold grapefruit-lime cocktail with ginger and rosemary to take you to your favourite beach! 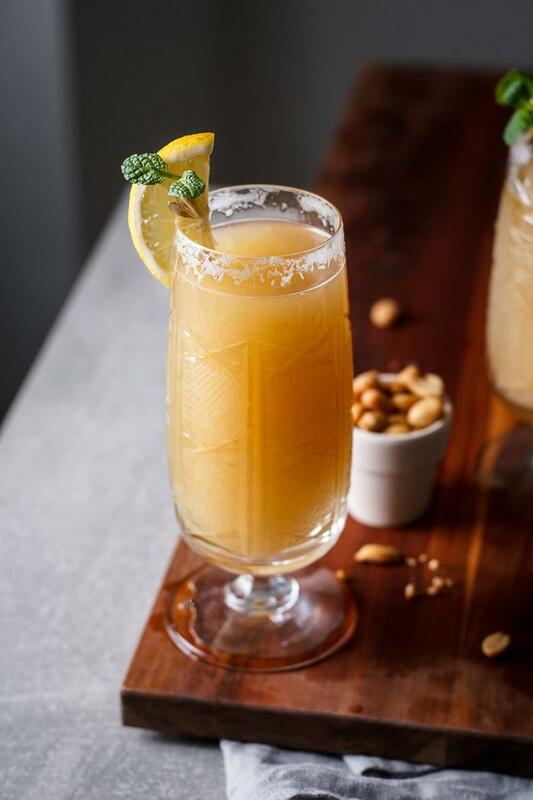 Have you ever sat down in a nice cozy chair on a sandy beach somewhere far far away, having a waiter bringing you a cocktail whenever you ran out of the previous one. If your answer is YES – you’ve got my admiration and a bit of jealousy 😉 . I haven’t done that yet, but it is on my THINGS-TO-DO-BEFORE-I-DIE LIST. Until then, I’m making my own coctails, or if I’m feeling extra adventurous, I’ll go out and order a mojito! This cocktail I’m showing you today is not a mojito, but it also contains white rum. Yum, right? 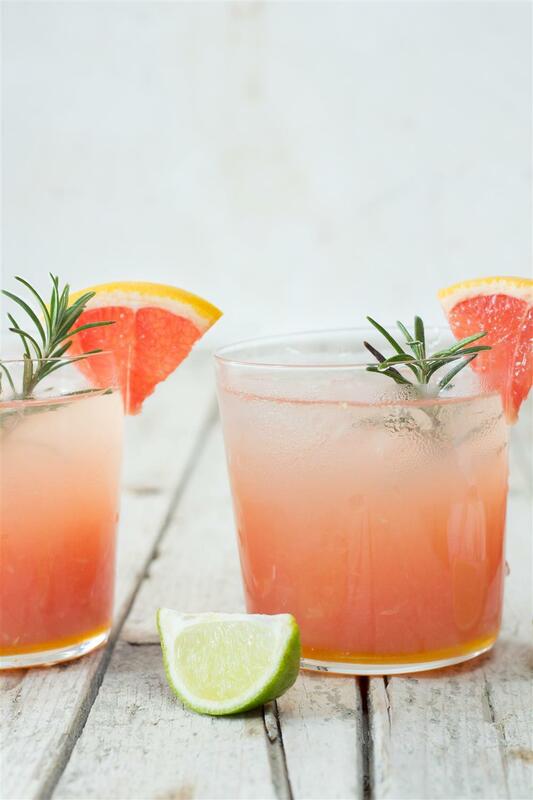 Luckily, I have a whole fridge of these delicious grapefruit-lime coctails in my fridge. Let me tell you, where the hidden trick is. It’s all in the ginger and rosemery syrup. 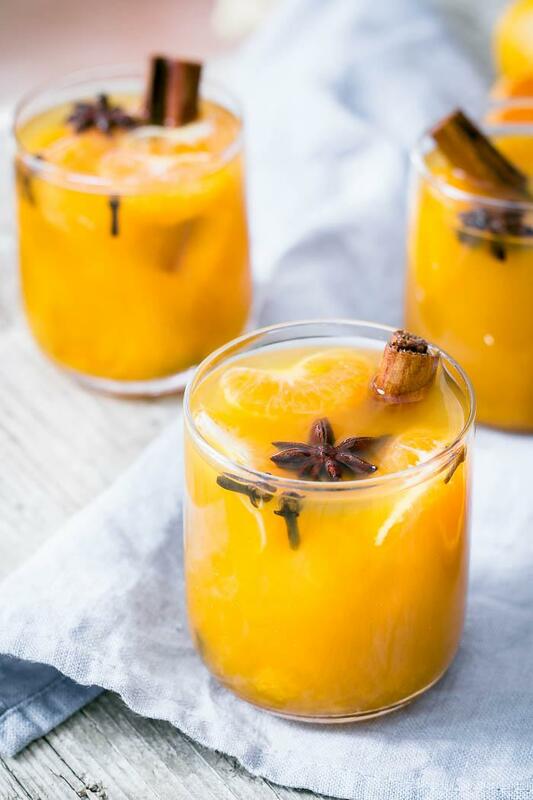 It’s a syrup that you can prepare in advance and keep in the fridge for a week, so you’ll have it on hand, whenever you feel like having a drink. 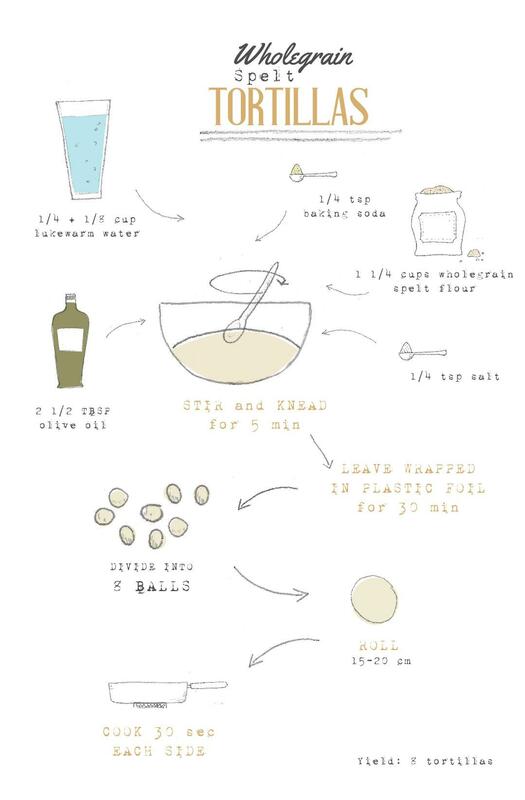 It’s a pretty simple syrup. You boil the water with ginger and rosemary let steep and add some honey. 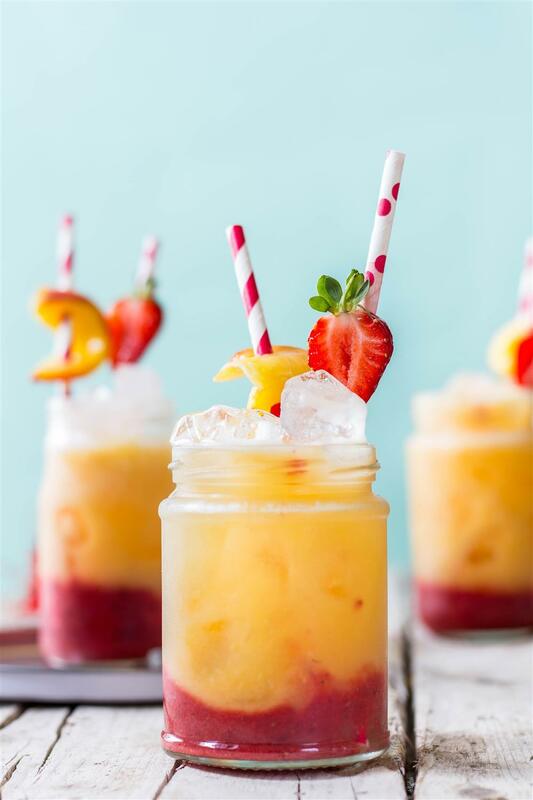 I’m not a fan of super sweet cocktails, unless that’s because of the actual sweetness of the fruit. I normally use honey or unrefined cane sugar, because I love how they make everything taste caramely. 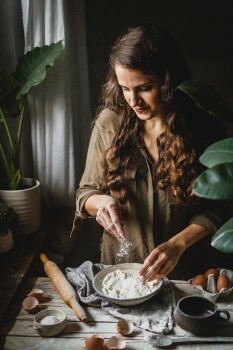 Why do I love this recipe so much? 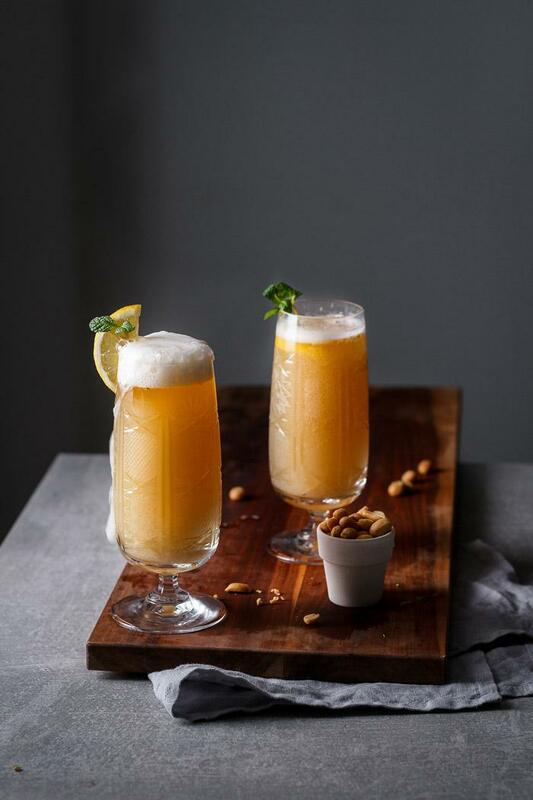 Because it is as delicious in a mocktail version as in the one shown in the recipe. 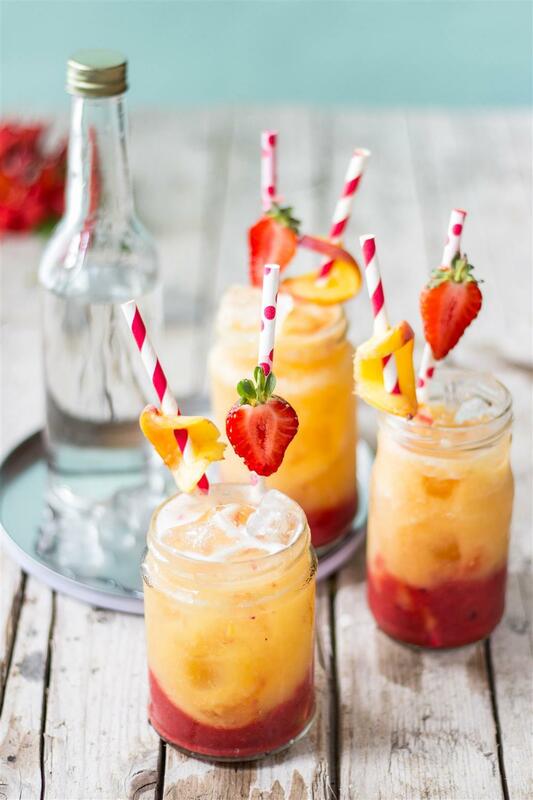 Simply omit white rum or replace it with sparkling water and you got yourself an everyday treat! 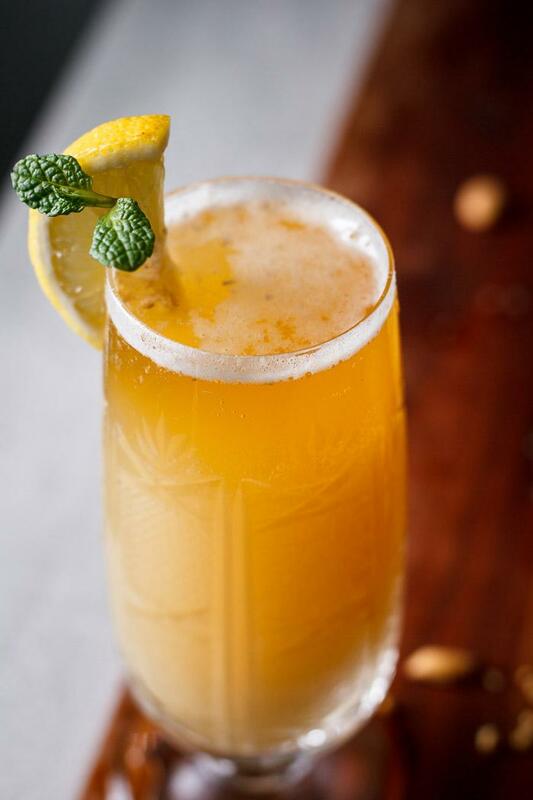 Ginger and rosemary syrup: Cut ginger in thin slices and vigorously roll rosemary between your hands. Place them in a smal saucepan and add 1 cup of water. Cover and bring to a boil, then remove from heat and leave to steep for 20 minutes. After 20 minutes add honey. 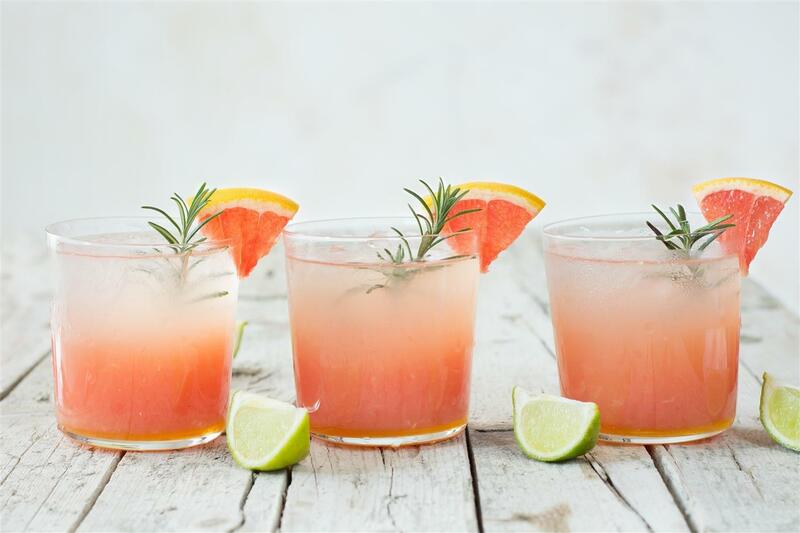 Grapefruit-Lime Coctail: Pour grapefruit and lime juices in 4 glasses. Add ice, almost to the top of the glass. Pour over the ginger and rosemary syrup, and white rum. 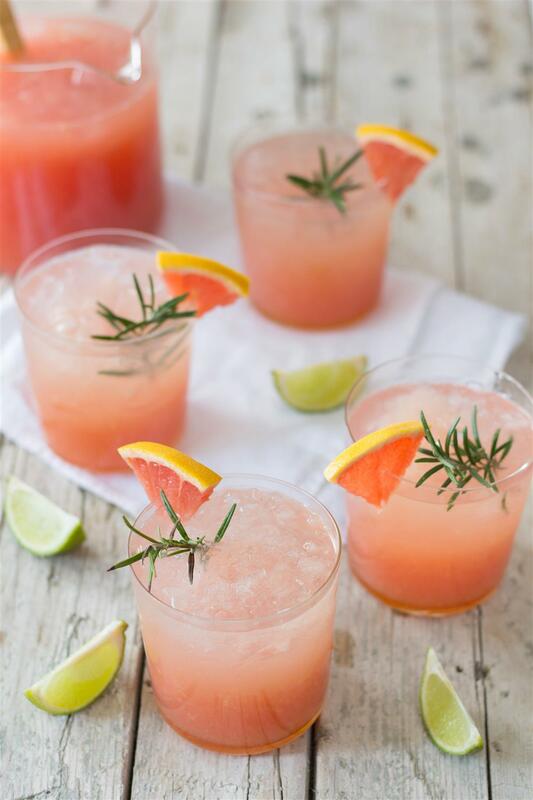 Decorate with stems of rosemary and slices of grapefruit. The recipe for the syrup is for 4 glasses. If you are making a batch, you can multiply it. 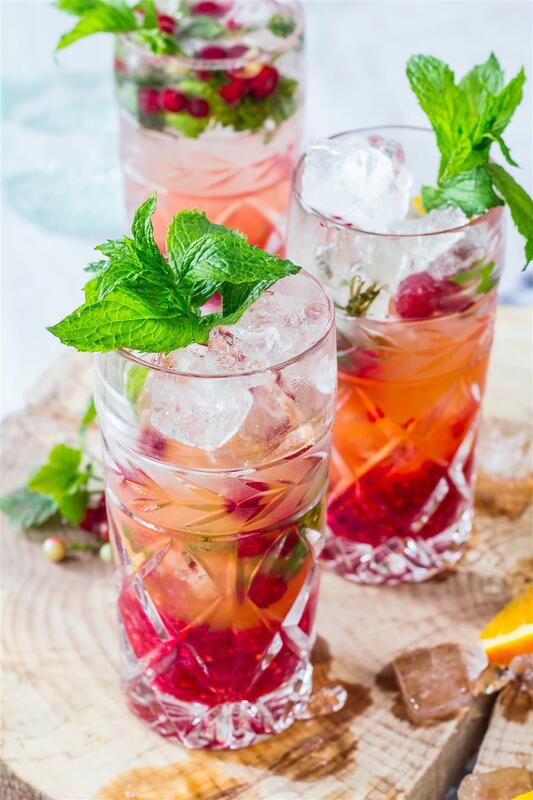 Mocktail version: Omit the white rum or replace it with sparkling water. 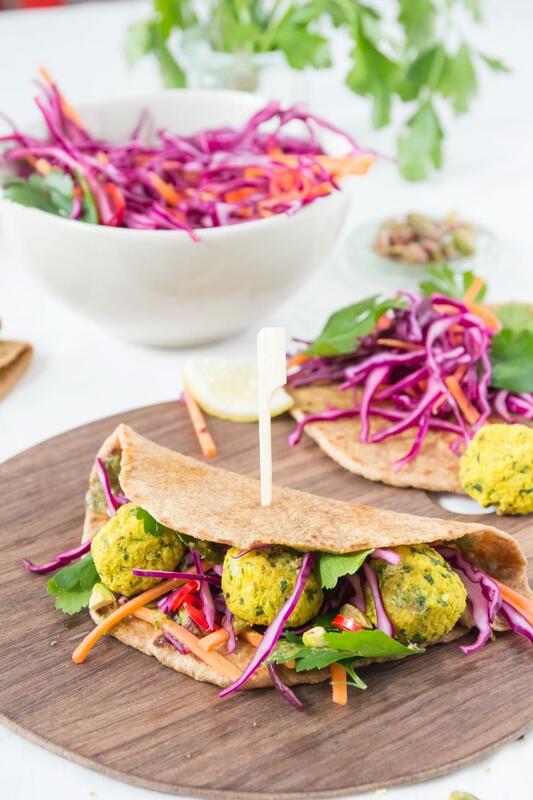 Fresh and healthy lunch with lots of colours to fill our daily rainbow – turmeric falafel wraps! And my favourite recipe for homemade wholegrain spelt tortillas! It’s March!!! Hmmm, it’s been March for more than a week, but my brain just grasped that. Okay, now. Let’s get to the recipe! I’m going double recipe today. 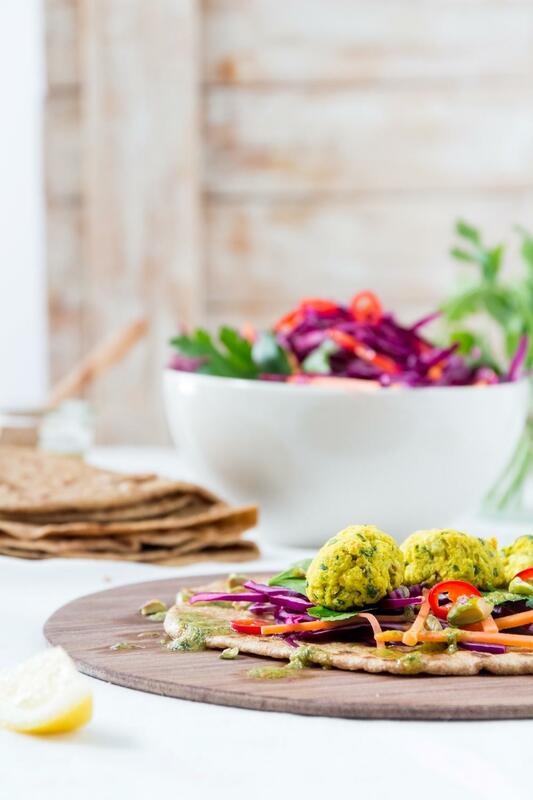 Wholegrain spelt tortillas that you can use like regular white flour tortillas and a beautiful bright yelllow turmeric falafel. What I love about these wraps – besides the obvious deliciousness 🙂 – are the colours. Colourful food makes me smile. If you like them use the sides that I used in this recipe or choose whatever coloured veggies you like. But choose a variety. Reds, greens, purples, yellows… Whatever you find, toss them in! If you are making homemde tortilla wraps (recipe below), make the dough beforehand and leave it to rest while you make the falafels. 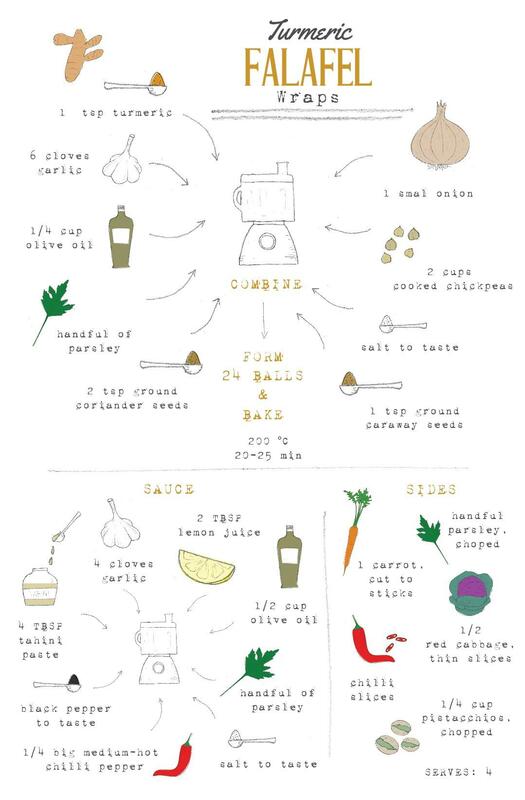 Falafel balls: Preheat the oven to 200 °C and line a baking tray with baking paper. Pulse all ingredients in a food processor untill well combined. It should have an almost creamy texture with some small crumbs. Divide the mixture in quarters. With slightly wet hands, form six balls from each quarter. Wash your hands if they get too messy, otherwise the mixture will start sticking to them. Place the falafel balls on the baking tray and bake them for 20-25 minutes or until just slightly golden. 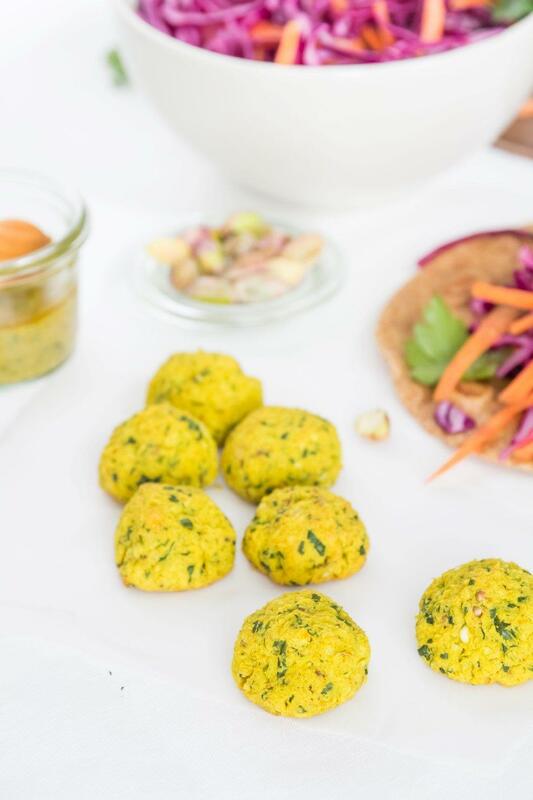 These falafels are very delicate, so treat them carefully. Sauce: In a food processor or a blender combine all ingredients and pulse until the mixture is smooth. Sides: Chop red cabbage and carrot into thin slices and drizzle them with lemon juice. Chop pistacchios and parsley coarsley. Wraps: Divide the dough into 8, roll them and cook them 30 seconds each side. 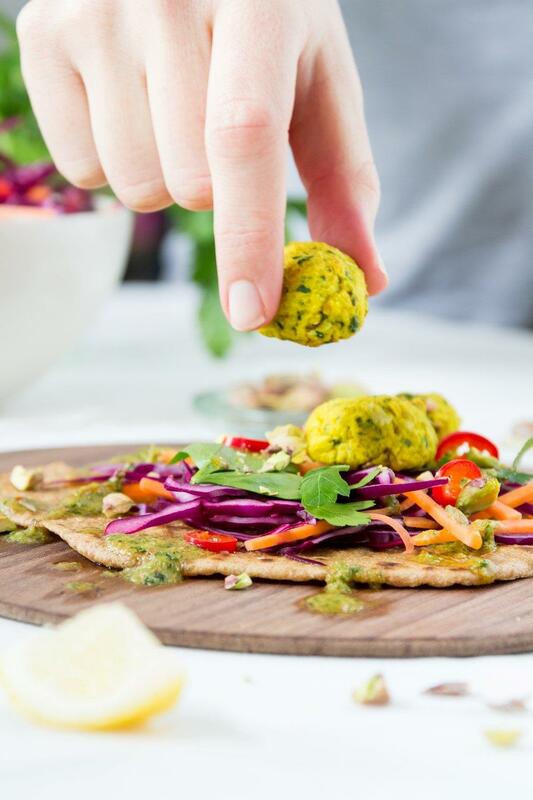 Serve falafel balls with sides and tortillas while they are hot. Combine all ingredients in a bowl, then trasfer it to a flat surface and knead it for 5 minutes. Cover with plastic foil and leave it to rest for 30 minutes at room temperature. Divide the dough into 8 balls, flatten them with the palm of your hand and roll them out on lightly floured surface to 15-20 cm in diameter. Don't stack the rolled tortillas or they will get soggy. Brush off excess flour. Cook on a griddle or big pan over medium-high heat for about 30 second easch side. If flour starts to accumulate in the pan, wipe it off with a paper towel.